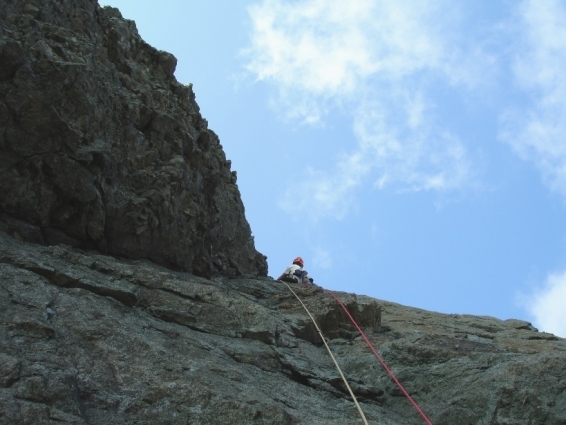 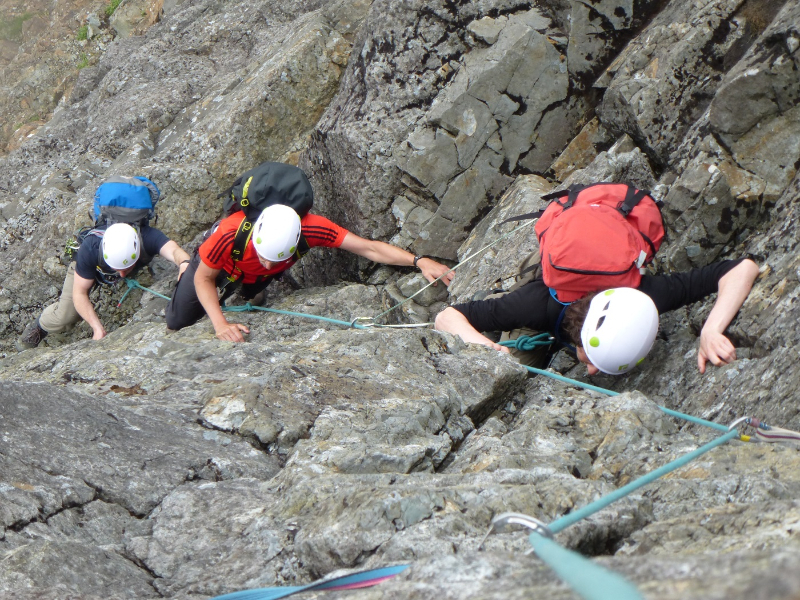 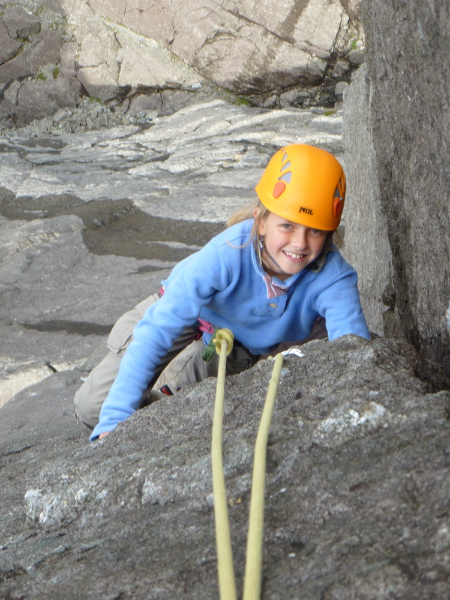 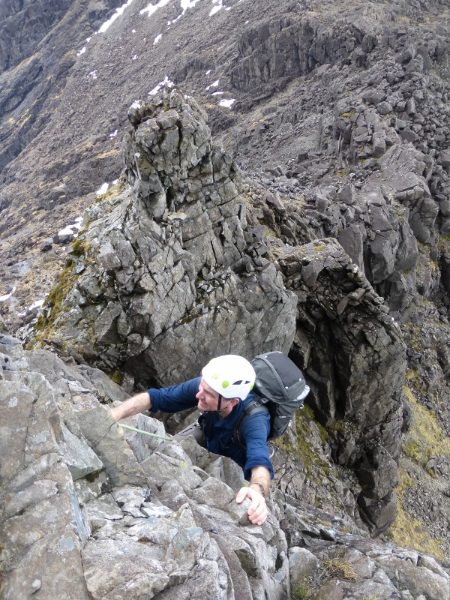 I never use the same route twice and we found some delightful clean ribs well to the left hand side as we approached the abseil from Dubh Beag. 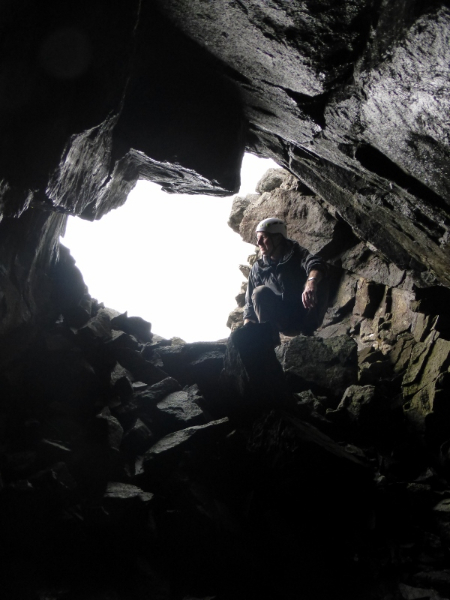 Great excitement for me was finding a huge cave feature that I’d never even spotted. Somebody has even smoothed out the base to make it comfy enough to lie down in. Looking out from the new cave. 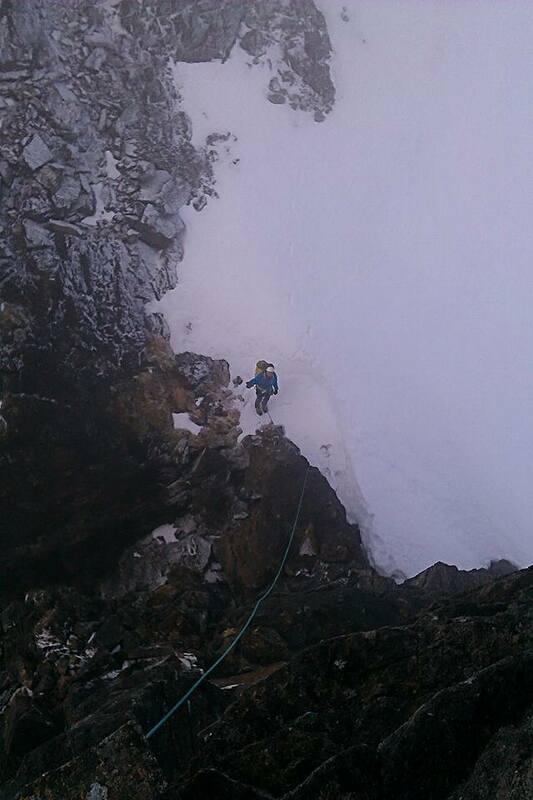 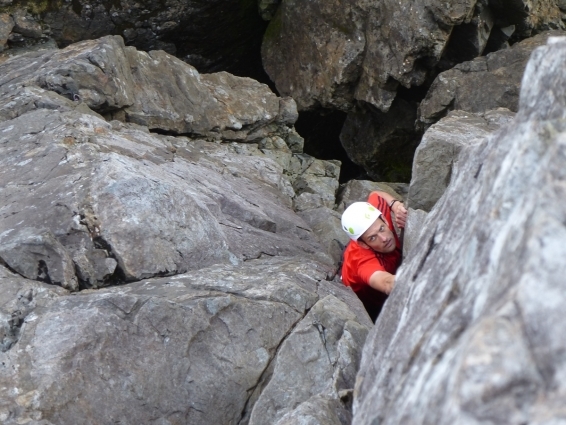 Paul climbed very well and we even had time for a look into the TD Gap which was horribly cold and greasy. 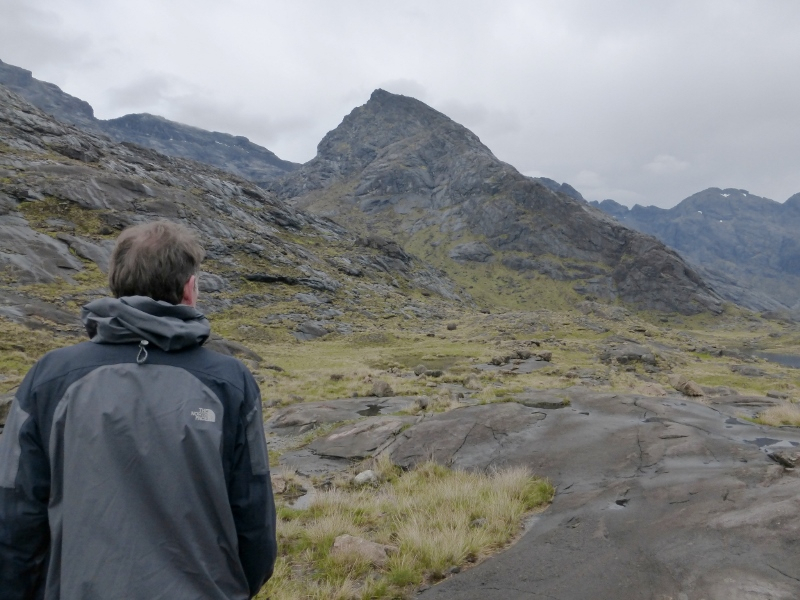 The final part of the plan was meeting Ian and Jon and take their car back out of Glen Brittle. 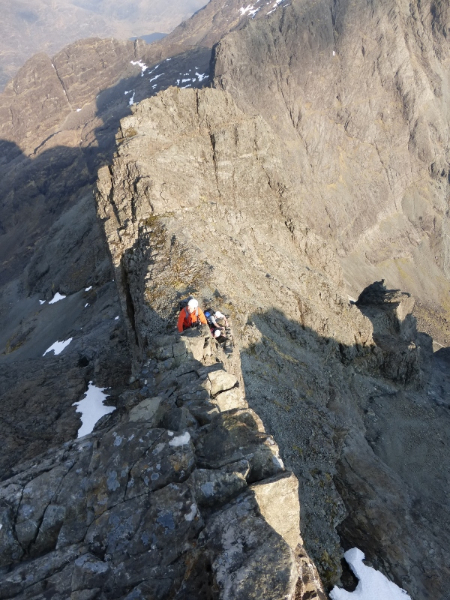 They started their Traverse by heading up to spend the night in Coire a’ Ghrunnda before a long & successful day next day. 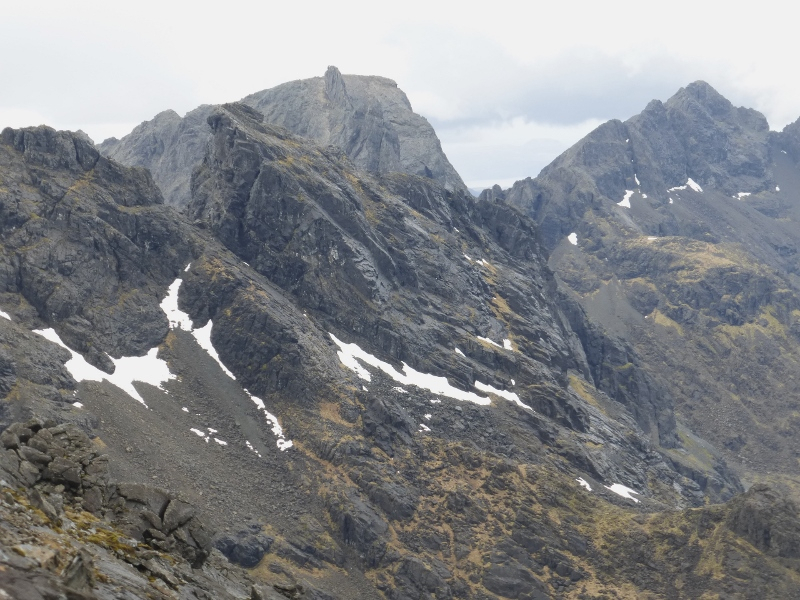 Francis & Ulrich were also successful. A seasoned alpinist Ulrich came round to visit me the next day. 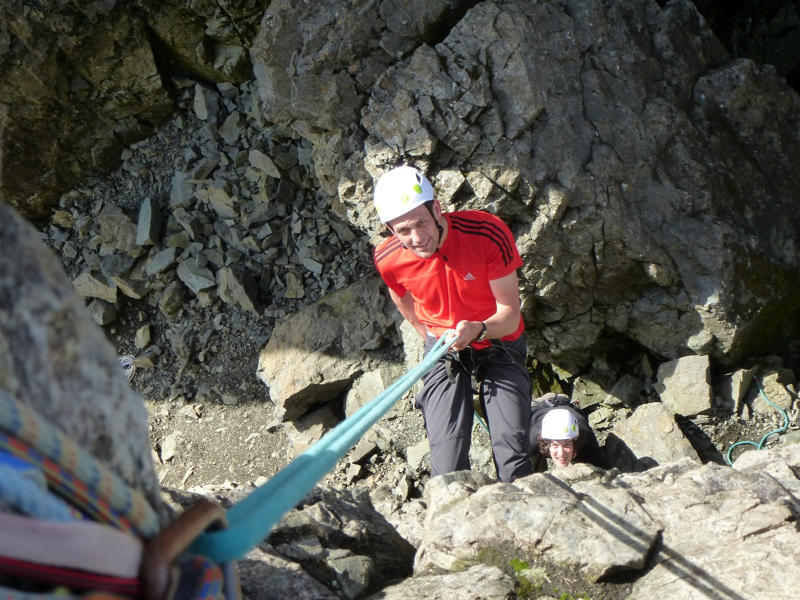 He had very kind words about Francis being amongst the best guides he has ever used. 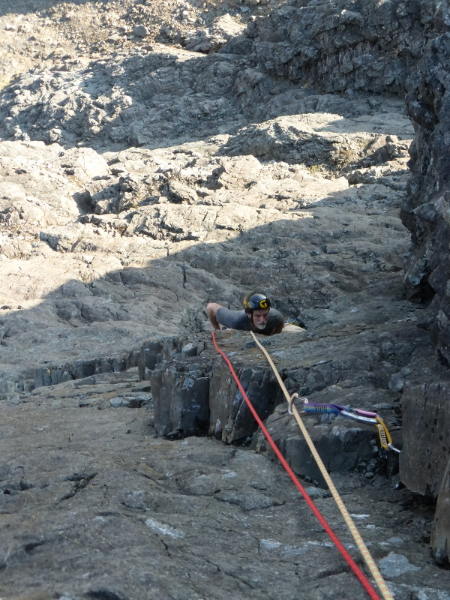 He was equally complimentary about the Traverse. 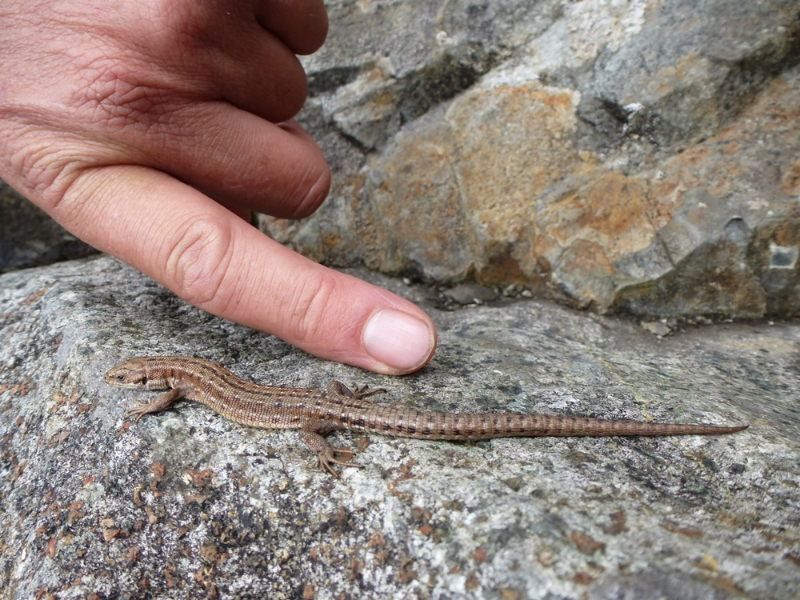 It was far, far bigger than he expected and bigger than most alpine outings. 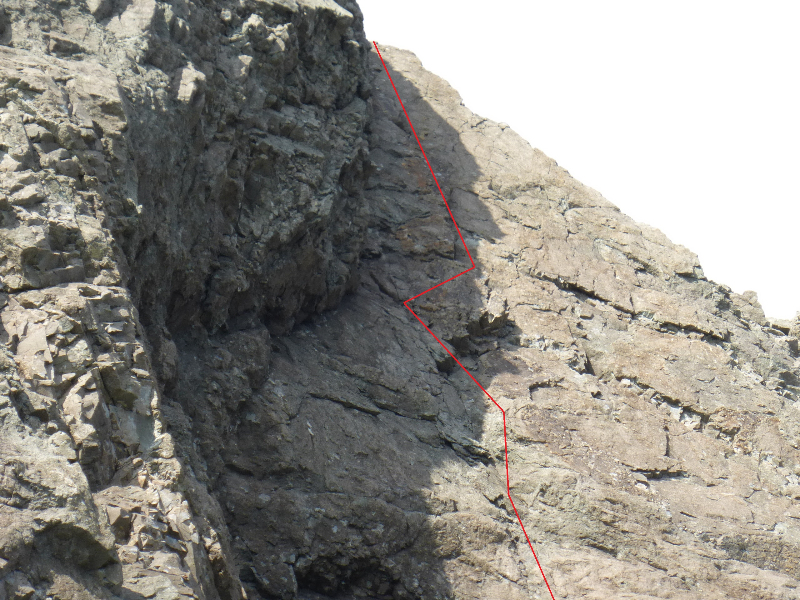 For reference the timings for this Traverse, in good conditions, were 2 hours ascent, 17 hours of climbing from one end to the other (with a bivouac as well) and 3 hours to descend; a total of 35 hours from start to finish. 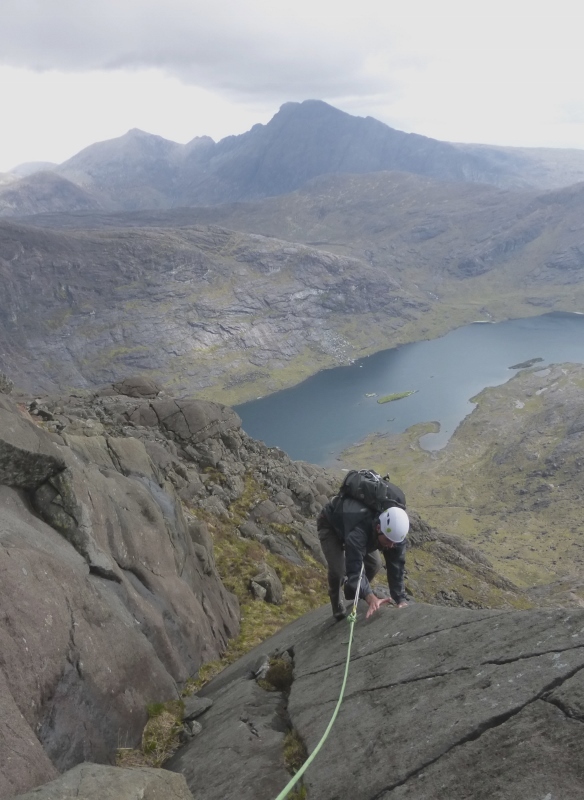 Dry rock and a warm breeze is too good to ignore so Paul & I dropped work plans and headed off to An Stac in search of some adventure. 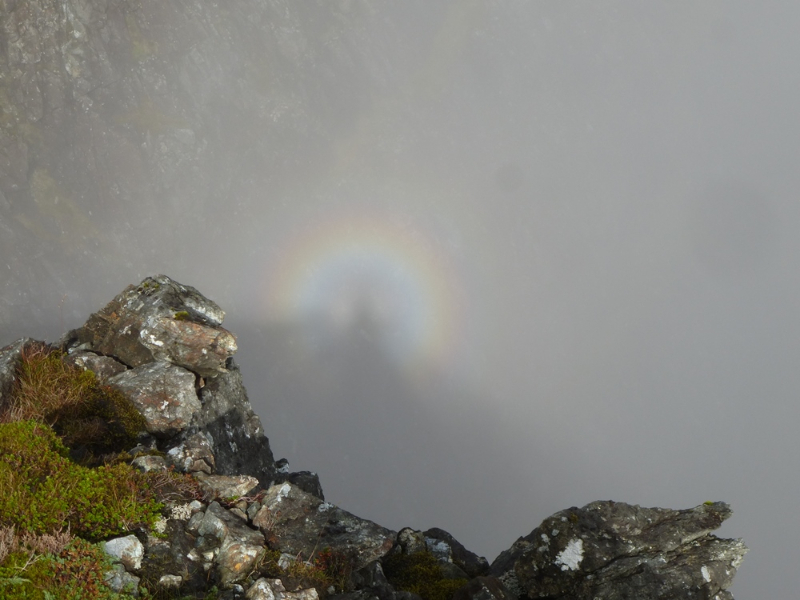 What’s in that shadowy corner? A steep curving fault line just below the summit had attracted my eye for a few years but it was hard to tell what angle the climbing would actually be. 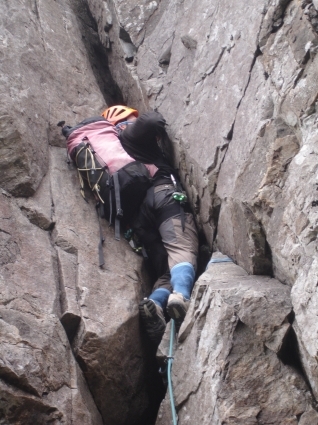 Perhaps just an exposed scramble or just plain impossible? 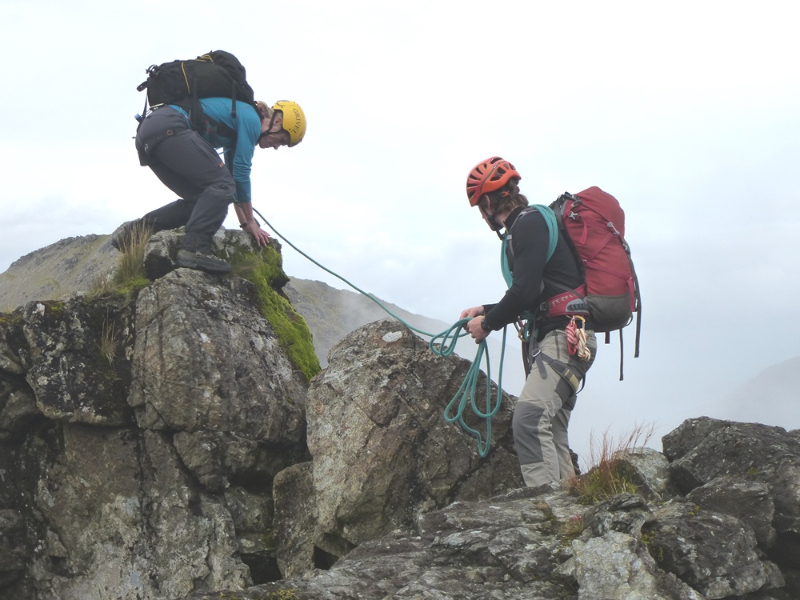 80m of great exposed scrambling, easy in our rock shoes, led us up to the start of the overlap and a wee struggle to find much of an anchor. 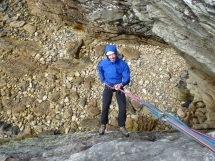 Paul led up the next 20m and the theme of delicacy and carefully choosing which rock to place protection in continued. Above this slabby ledge the corner itself looked crumbling and hard, out right looked more solid but definitely avoiding the line of the challenge so I choose a faint groove heading straight up. 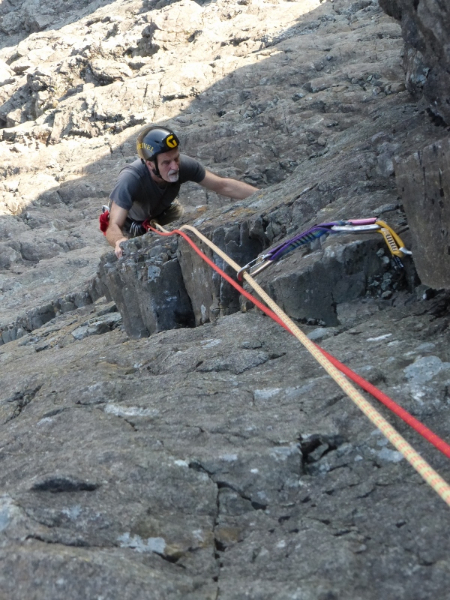 A cam buried deeply into hollow sounding rock was soon matched on the other rope with an RP2 – times are a bit tough when I resort to placing micro-nuts in gabbro! 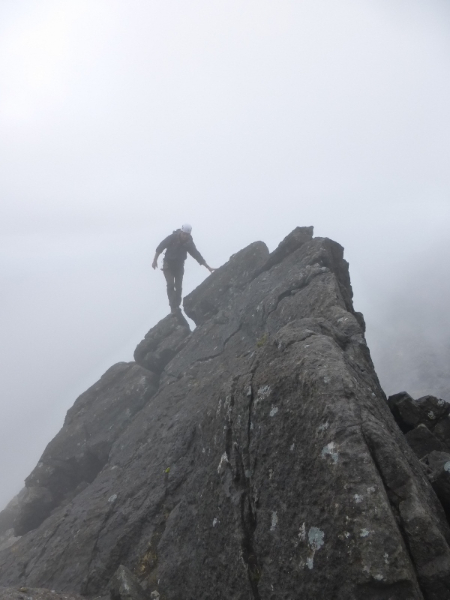 Time to climb…. 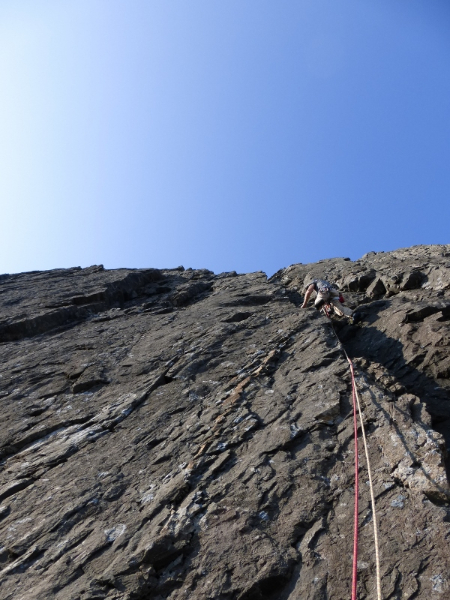 Avoiding some obvious lose flakes I found most of the holds solid enough as I tiptoed upward on the wonderful sticky gabbro. 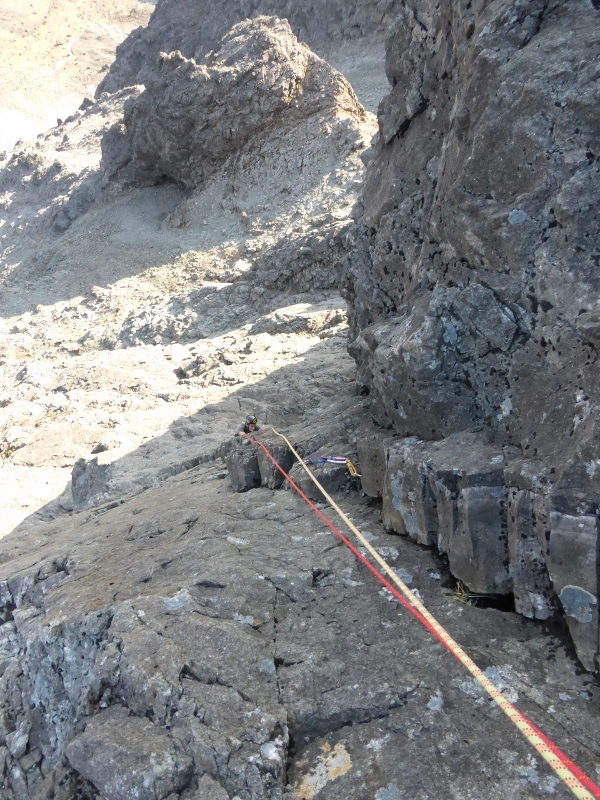 5m up a large offset cam fitted nicely into a hole where the basalt had separated from the face. 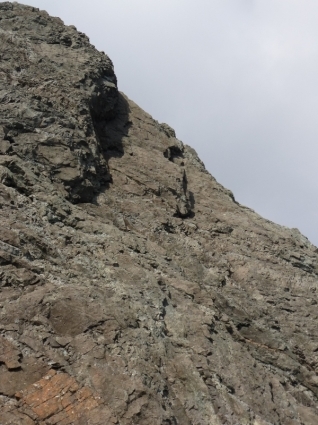 It seemed solid to touch but you can never be too sure and I was grateful to be able to “strengthen” this by using a screamer; clever type of extender that absorbs 4kN if it’s shock-loaded. 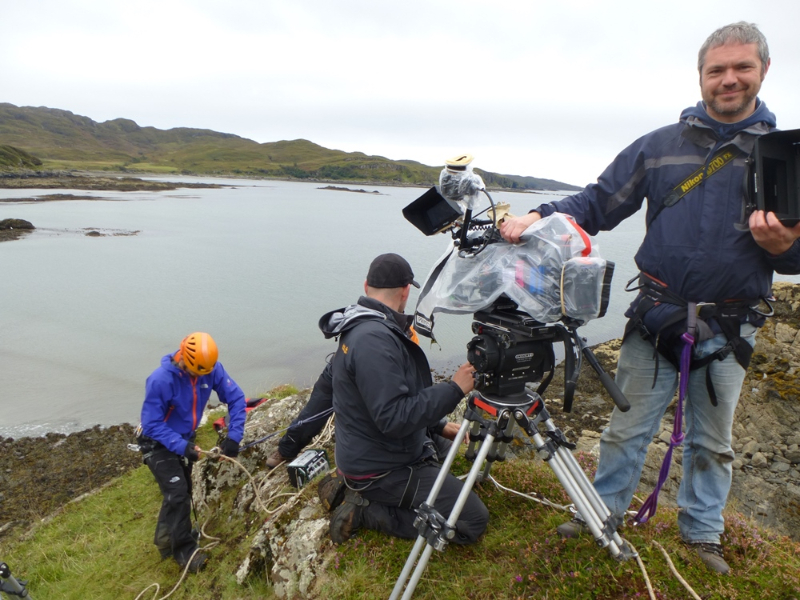 Doesn’t sound much but that’s the equivilant to removing the effect of a 400kg weight hanging from it! 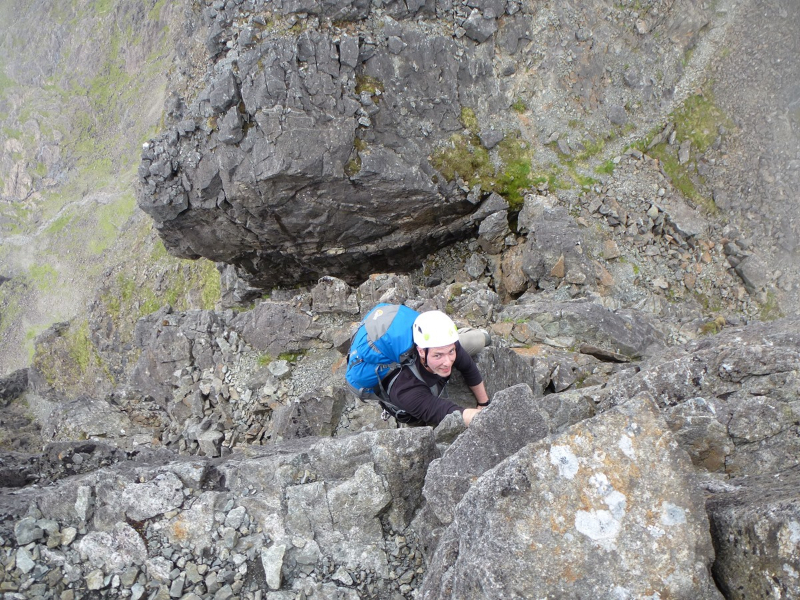 All good preparation for what was clearly, even for an optimist like me, going to be quite a run-out. The climbing that followed was beautiful, all in the feet but just the right number of positive and solid holds and the loose sections weren’t too hard to avoid. I discovered I was now climbing the surface of a basalt layer and surmounting this gave a good footstep rest. 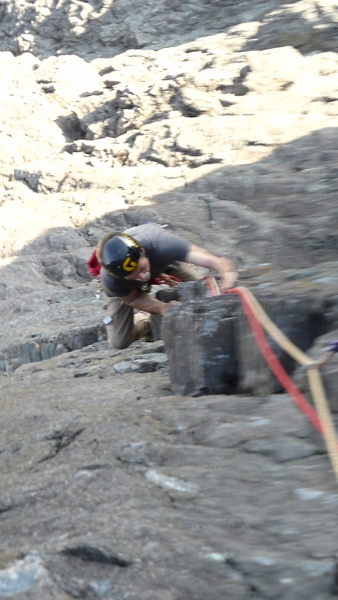 I got tempted into the corner next in an attempt to find protection, regretted it pretty instantly and escaped up and back right to the basalt ladder. 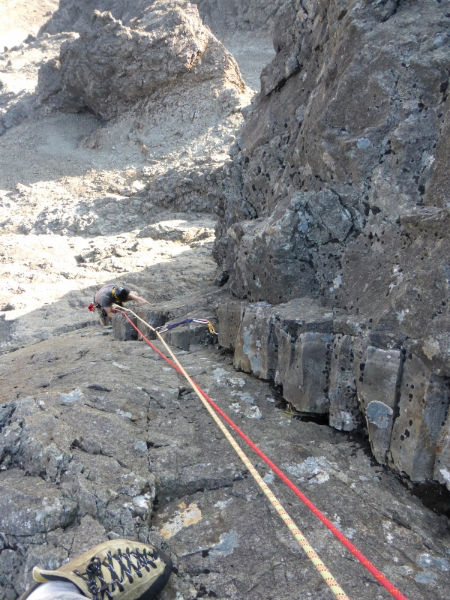 Pulling hard on your arms on this stuff always begs the question of how good the glue is, 60 million years after these layers were stuck together. 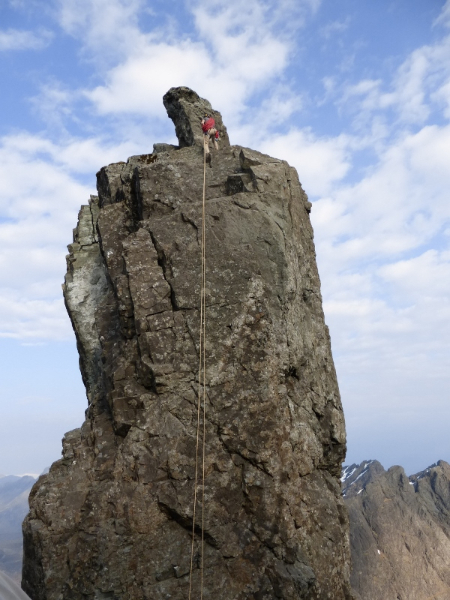 Fortunately I’ve always (touch wood) found it to be good enough for my bodyweight. 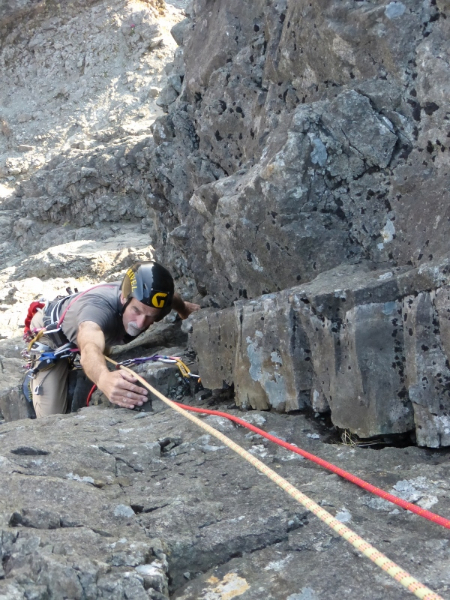 Another reasonable large cam kept things under control before flowing moves led to the top and a predictably difficult search for a solid belay. 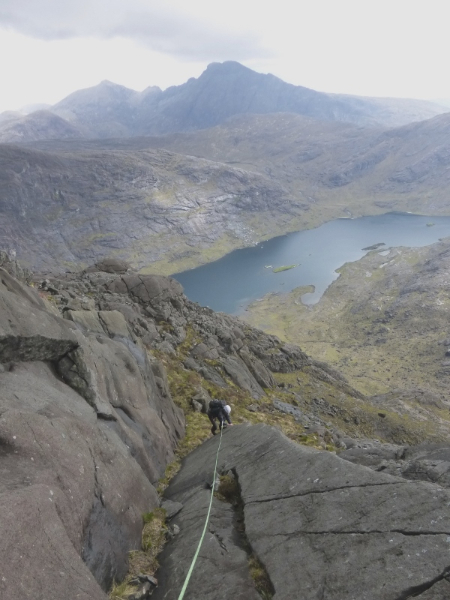 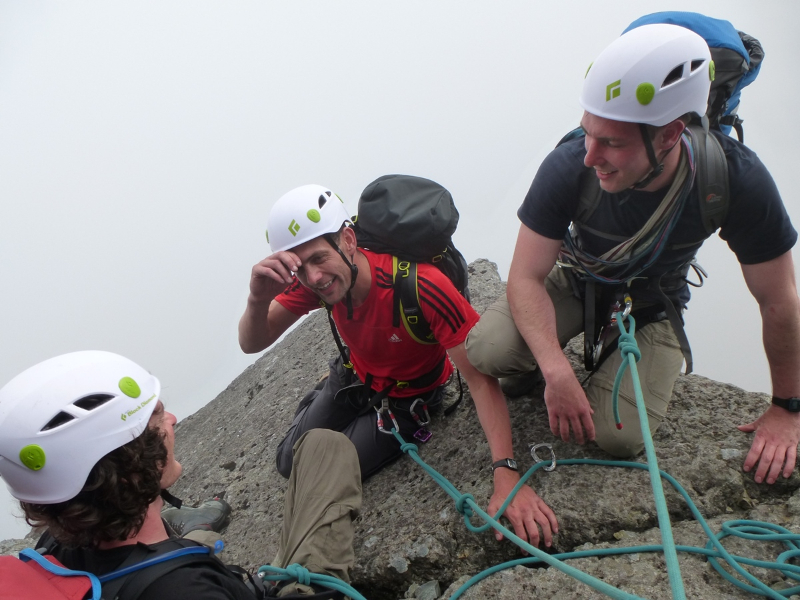 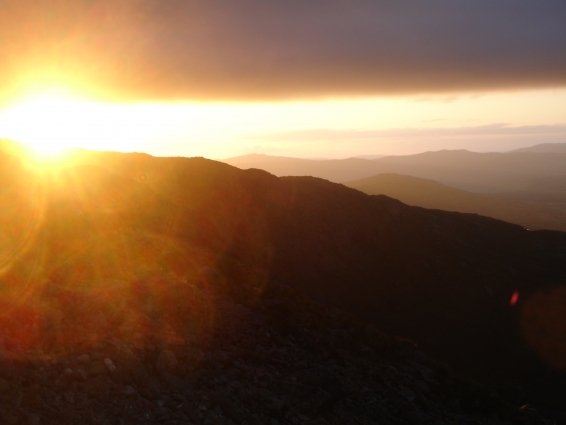 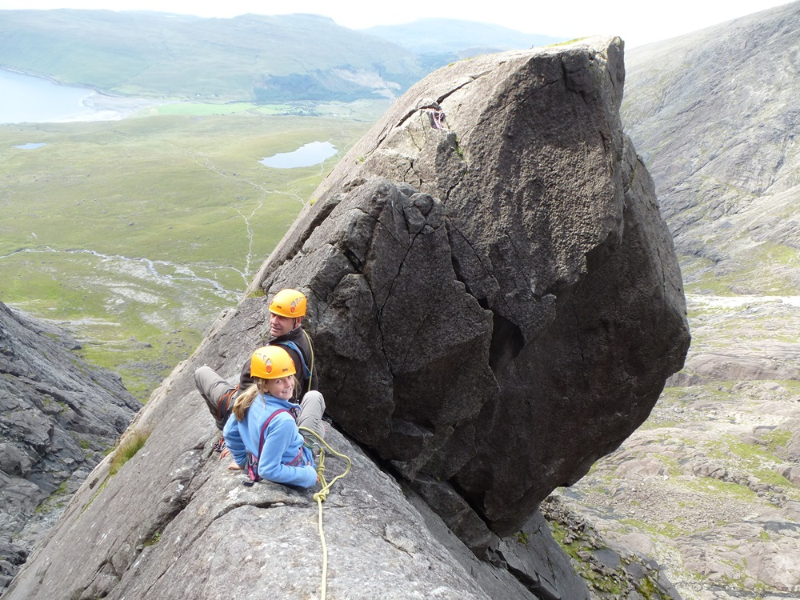 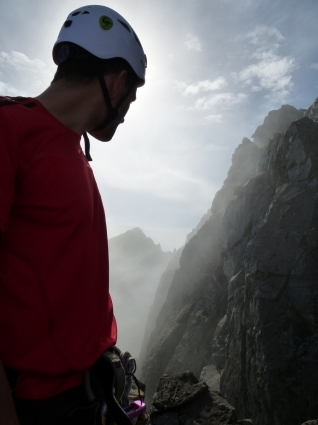 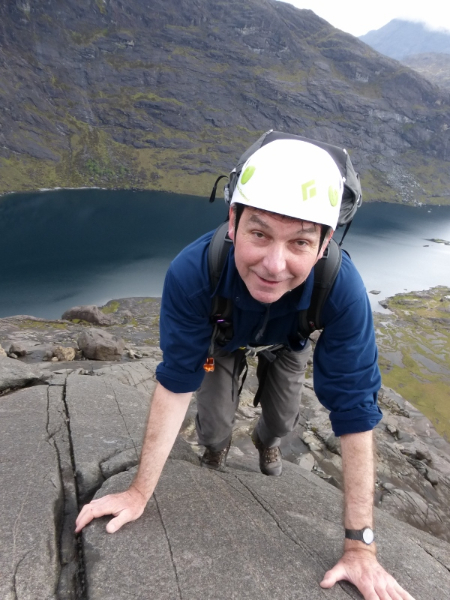 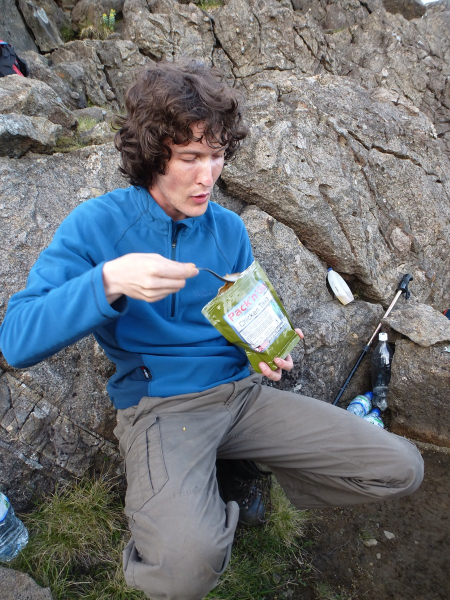 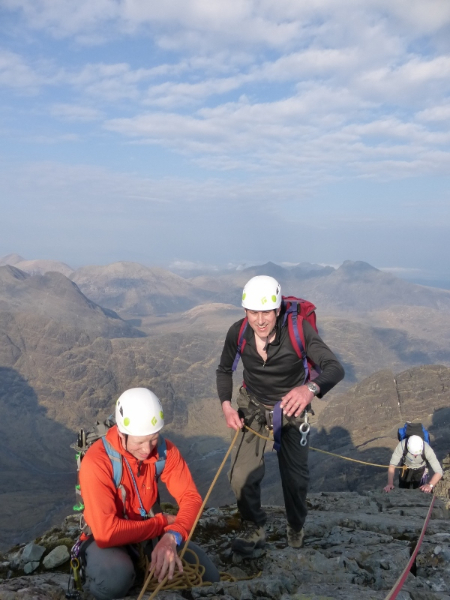 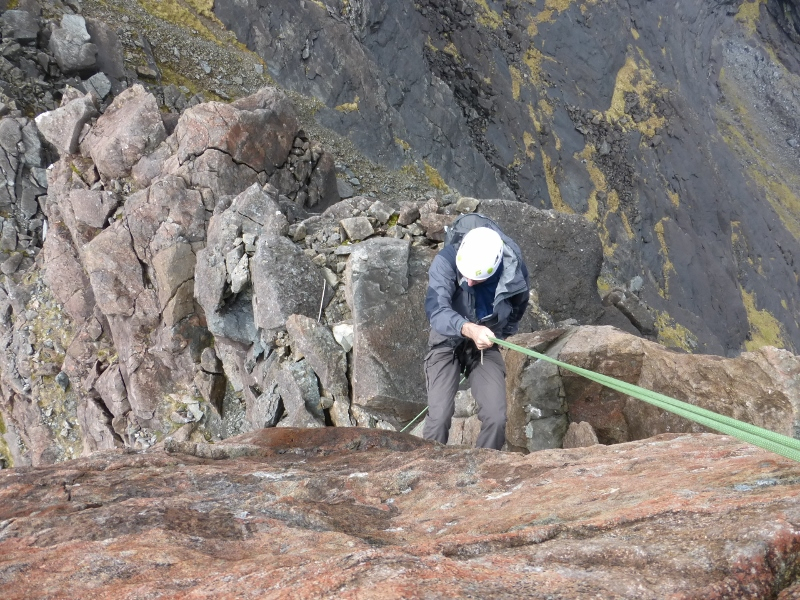 Paul romped up stylishly then ran the ropes out to the sunny summit of An Stac itself. 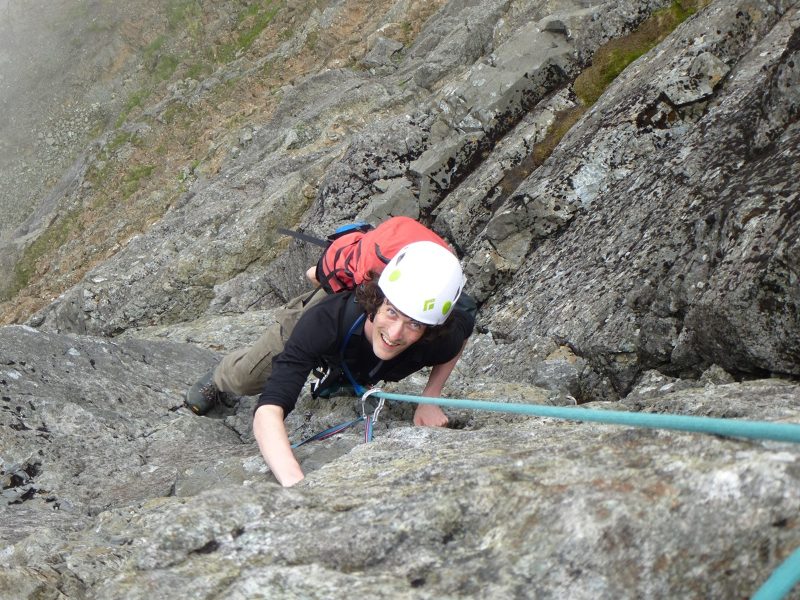 Good endorphine rush! 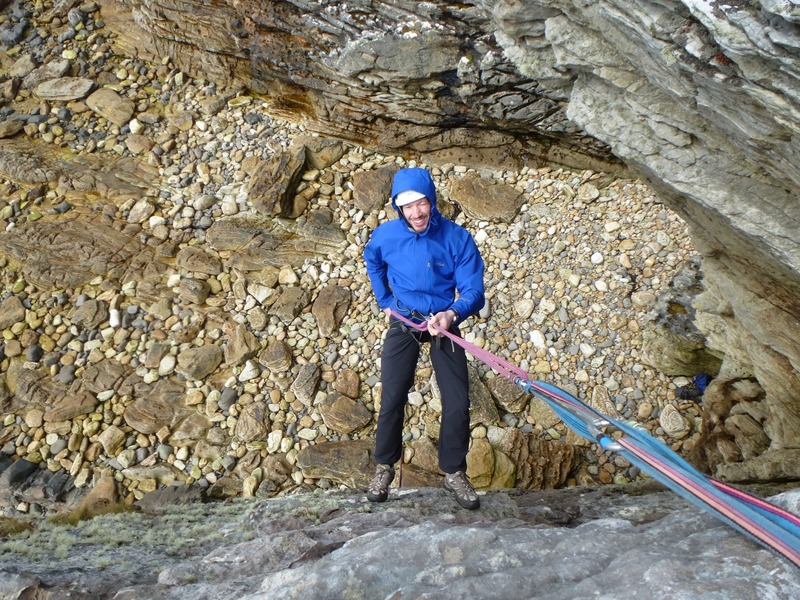 Quite a serious proposition but technically not too hard The Hanging Slab is about E1 5a. 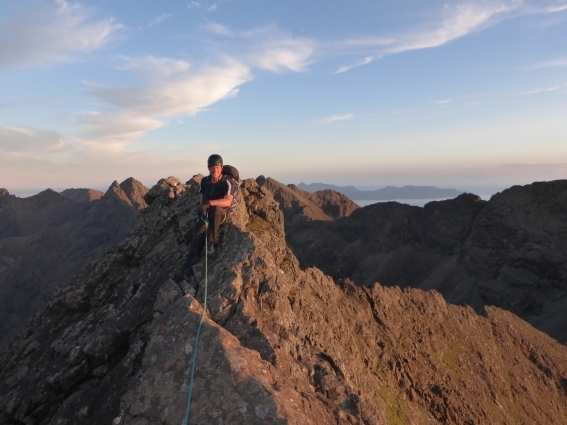 The In Pinn stood gleaming in the evening sunshine and it would have been rude not to climb it. 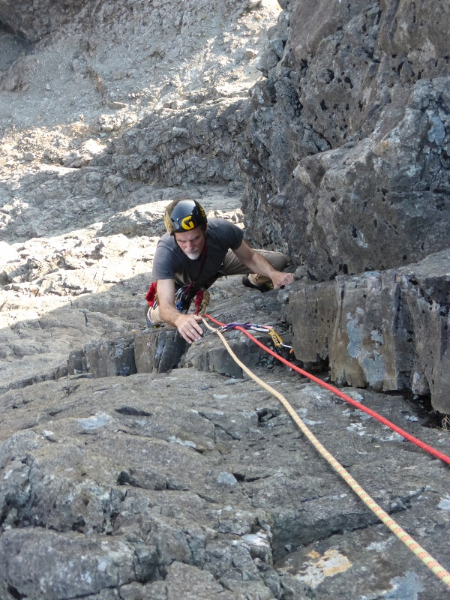 Paul led the 4 star Hard V Diff South Crack on delightful warm rock. 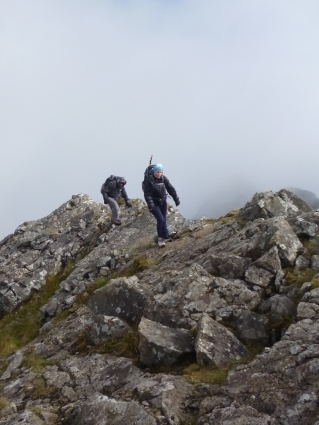 Francis popped up behind us with brothers Steve & Piers on their Traverse; hot work but all of them were “steadying away”. After an overnight bivvy near An Dorus the guys finished on Sgurr nan Gillean at about 2pm today; congratulations are deserved all around! 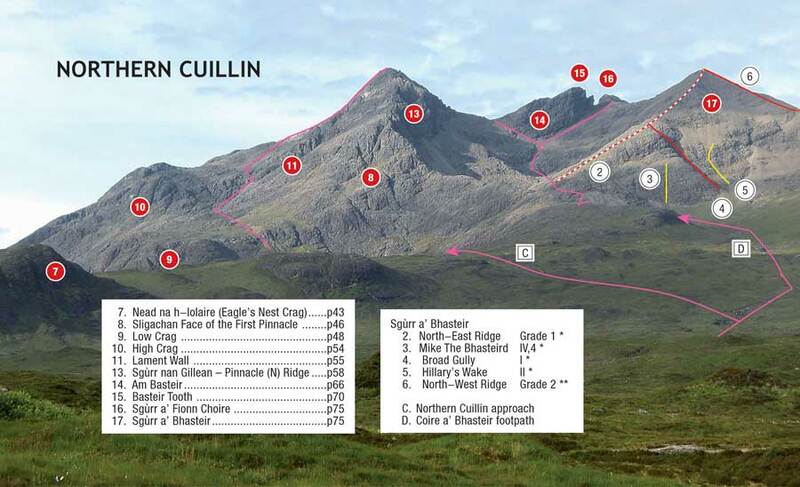 Harvey’s Cuillin map updates 2014. 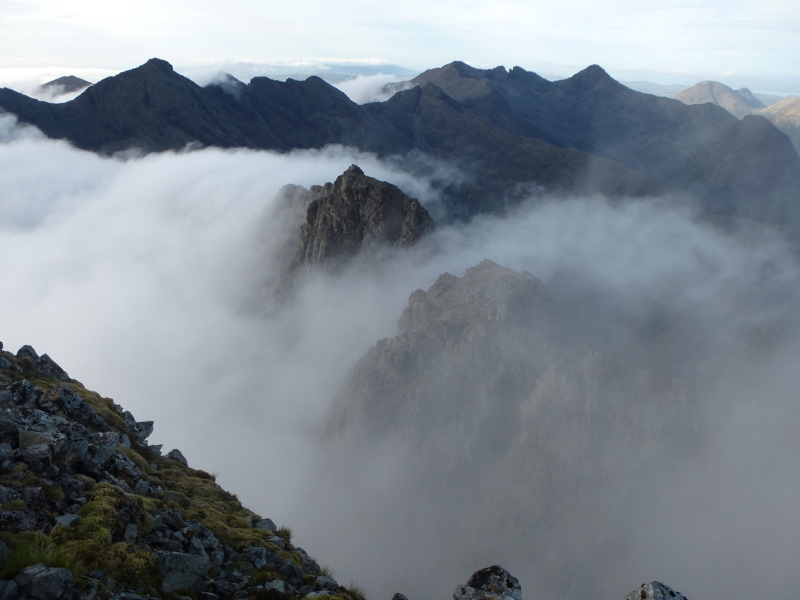 Anyone unfamiliar with the Harvey SKYE THE CUILLIN map should treat themselves to a copy this xmas. 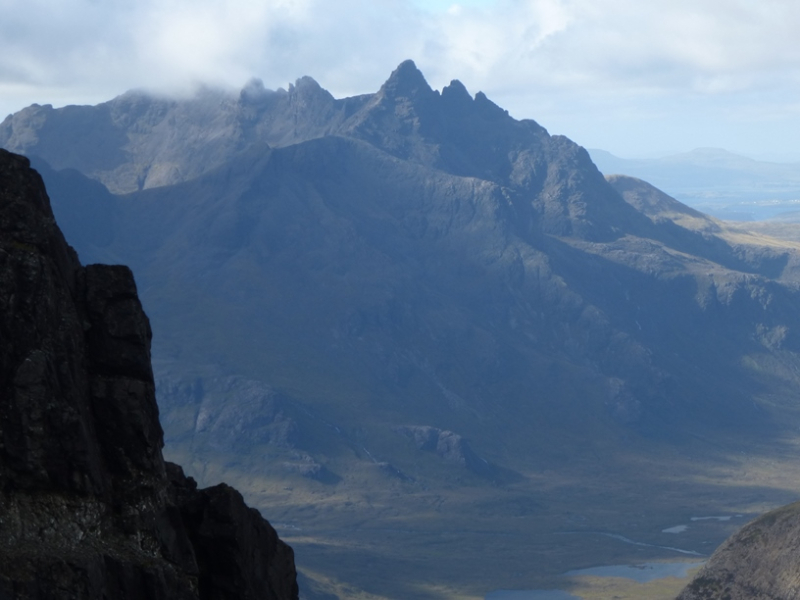 The 1:25,000 scale map covers a huge area from Broadford, up to Sligachan, Carbost, Glen Brittle and right across to Elgol. But it is the 1:12,500 enlargement of the Main Ridge makes it the only map of any real use to climbers and walkers wanting to explore the Ridge. 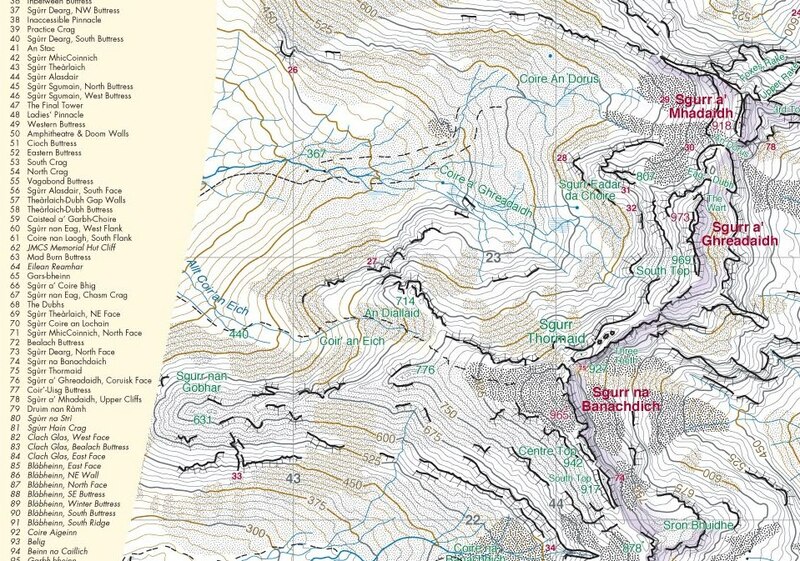 It’s been an enjoyable task this week helping Peter Child at Harvey Maps with updates for the reprint in January. 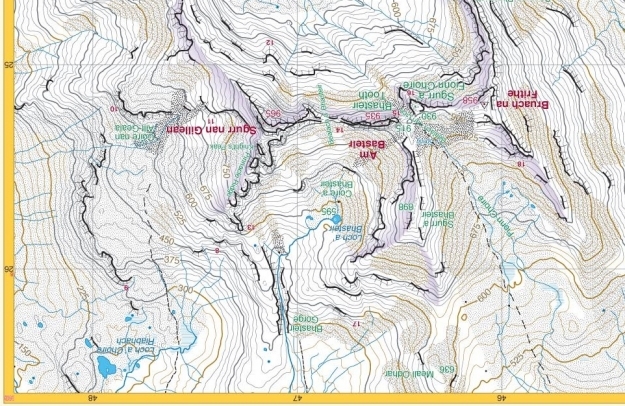 The project has been ongoing for quite a few years now; they reprint just about annually so map corrections can be easily added. 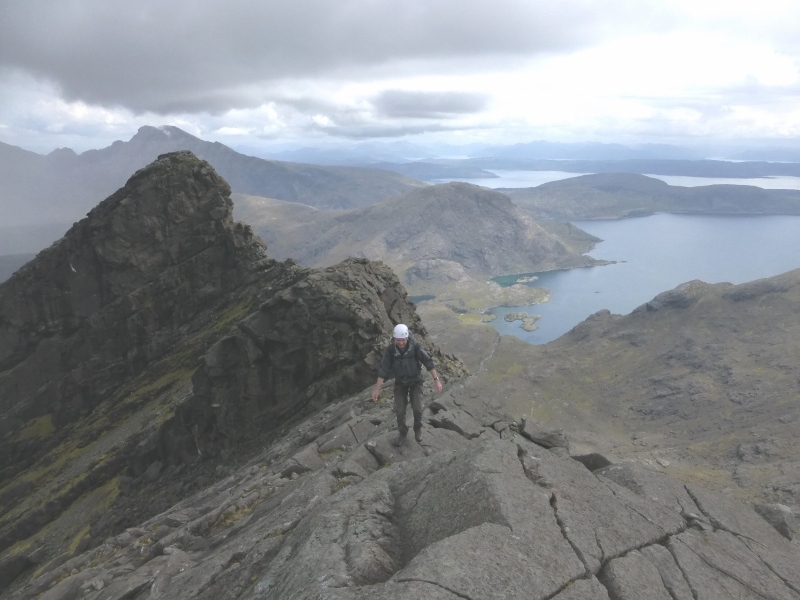 This year I suggested that some of the larger trails higher in the Cuillin could justify being added becuase they are comparatively easy to follow in good visibility. 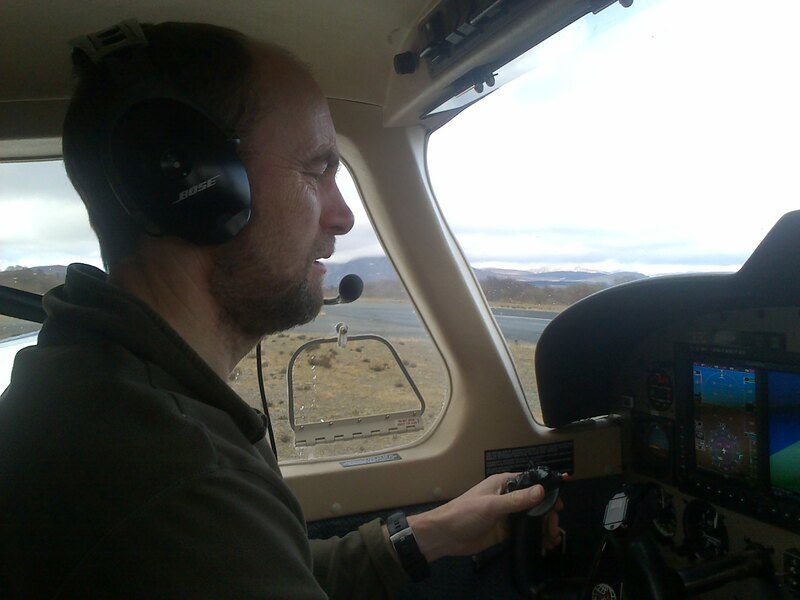 Pete was then able to double-check the ideas with aerial shots and produce an accurate end result that should aid a huge number of visitors. 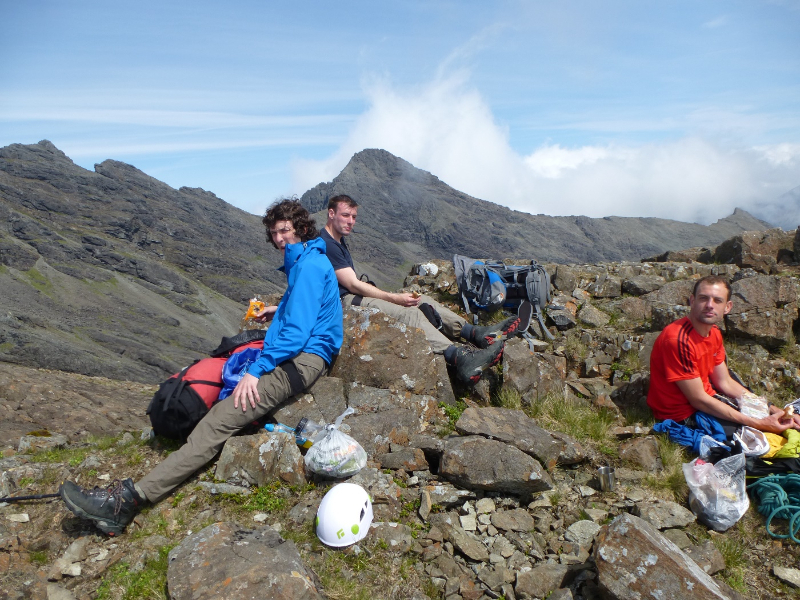 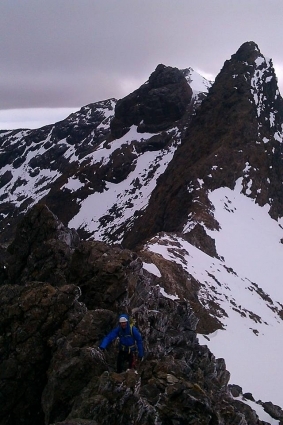 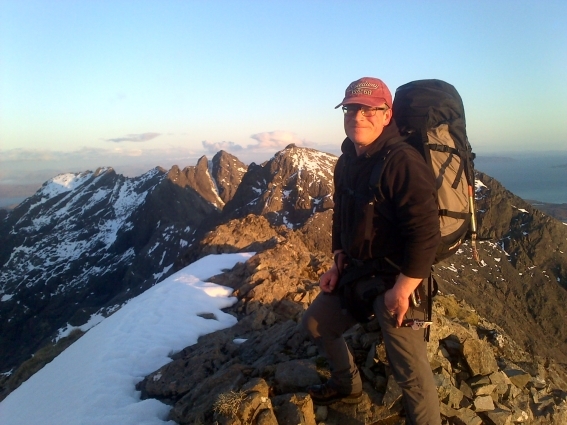 Sgurr na Banachdaich is well recognised as the easiest Cuillin Munro to attain and the route has become well enough pronounced on the ground to mark it nearly to the summit. 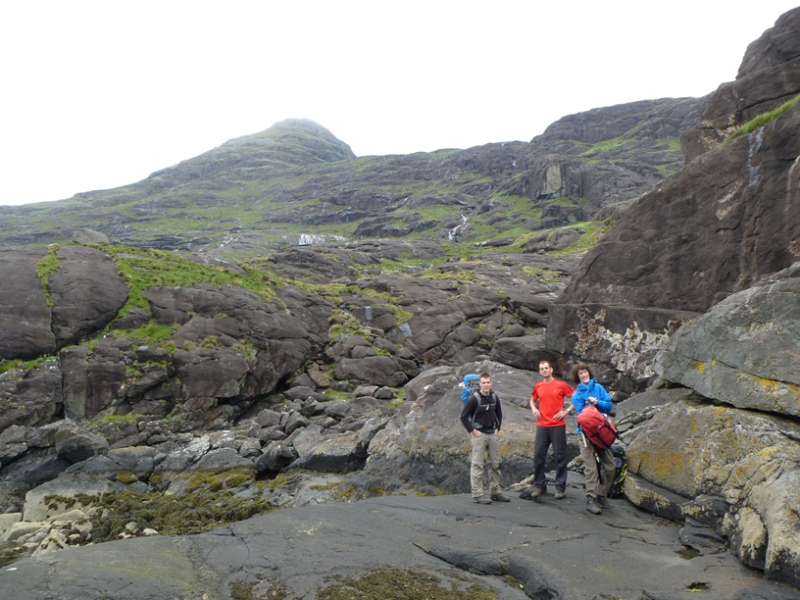 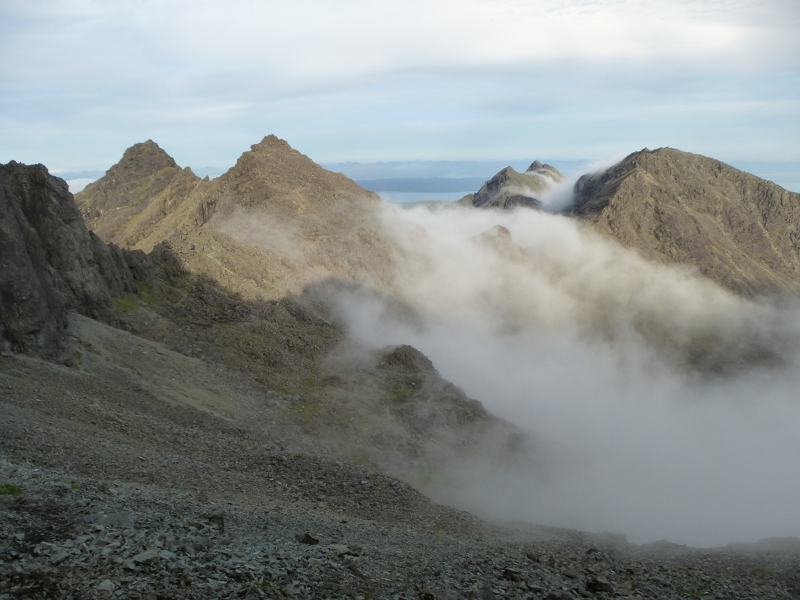 Correlating the SMC “SKYE THE CUILLIN” guidebook with the “SKYE THE CUILLIN” map has been the other major task. 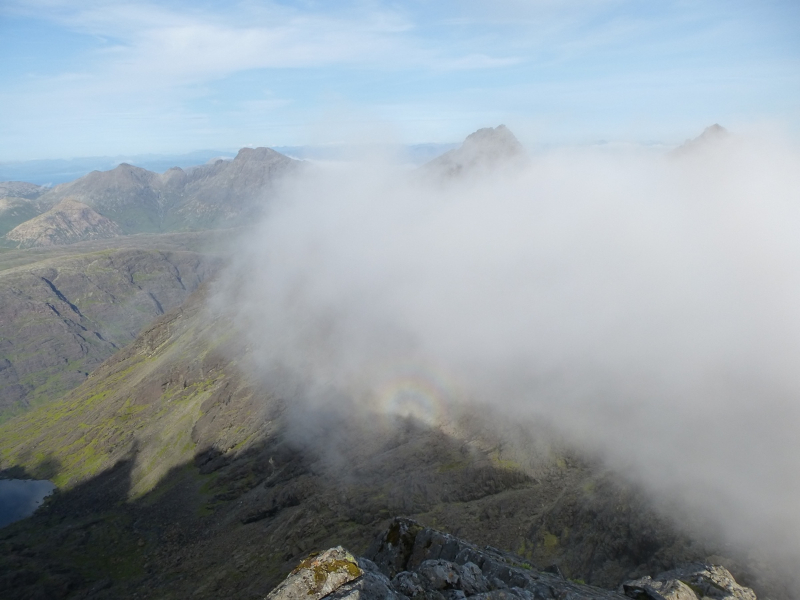 Photodiagram of the northern Cuillin seen from Sligachan; crags in red circles. 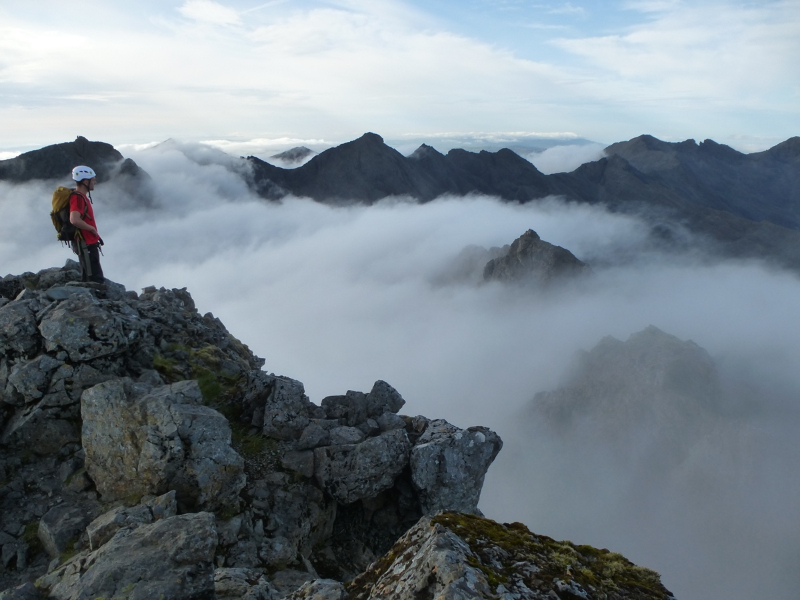 The 1:12,500 enlargement orientated for viewing the northern Cuillin from Sligachan; crag numbers in red. There are a total of 98 different crags from the book now all marked as close to the start of the climbing as possible. Previous editions of the map have, since 2004, had 55 crags marked; don’t worry these are all in the right place and match the map index. 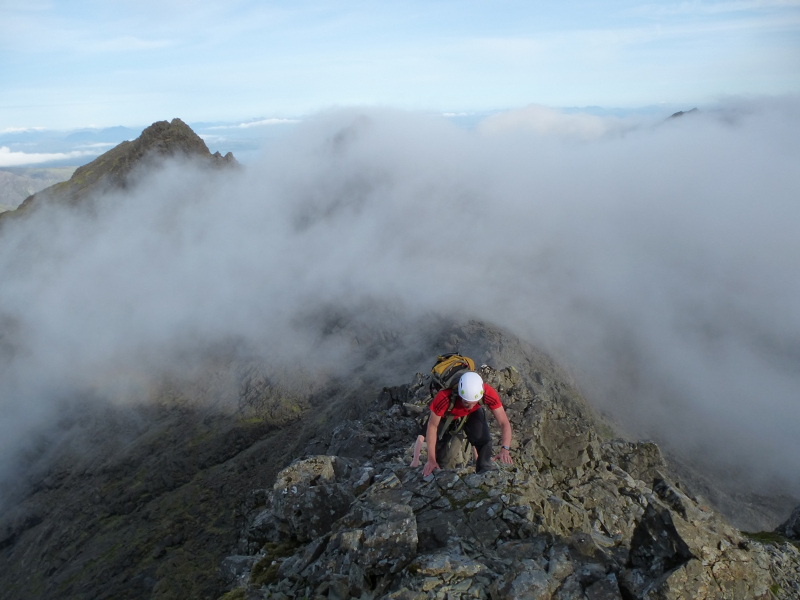 Fifty-five was the number of crags I thought the Cuillin had at the early stages of writing the guidebook. 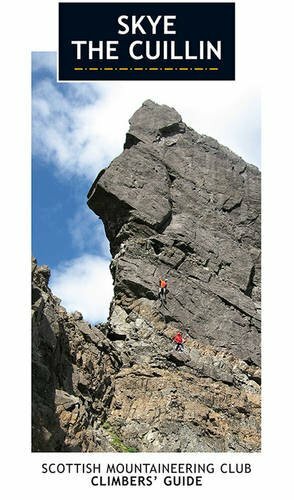 It was another 7 years before we went to print but the end result, particularly with these latest Harveys updates, means that climbers have a hugely increased chance of identifying and navigating to the cliffs they want to climb. 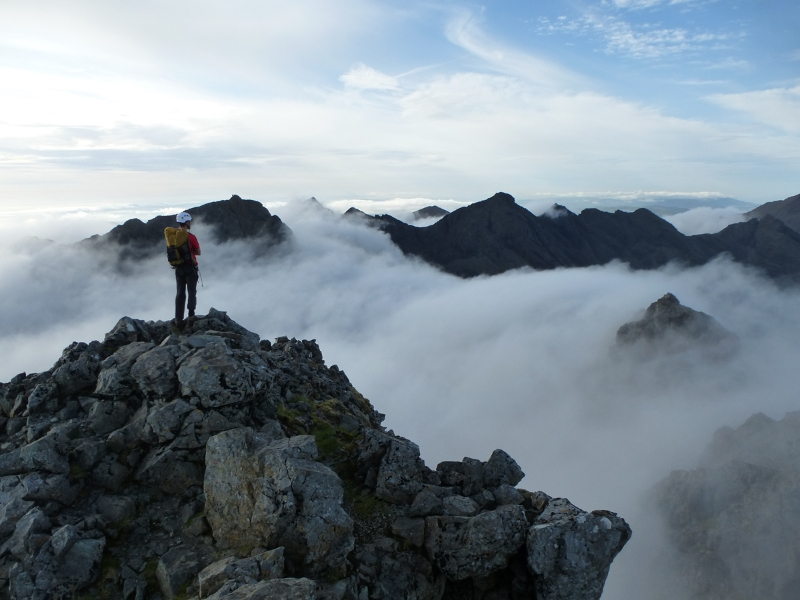 Signed copies of the Cuillin Guidebook can still be bought direct from us if you want another Christmas present! 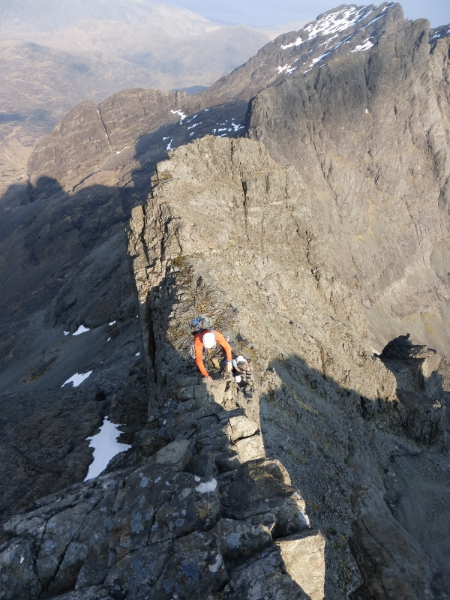 The most noticeable change on the 1:25,000 side is the addition of a section of The Skye Trail. 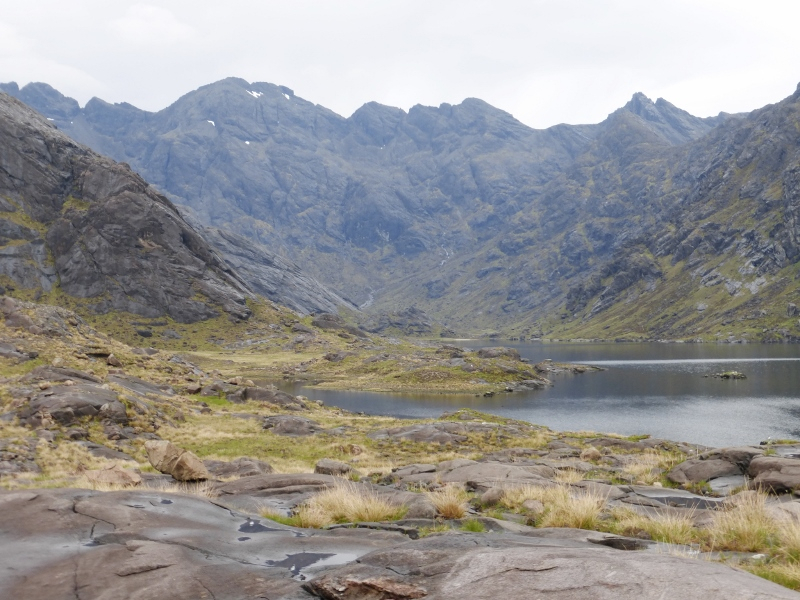 Harveys also sell a map specific to the Skye Trail. 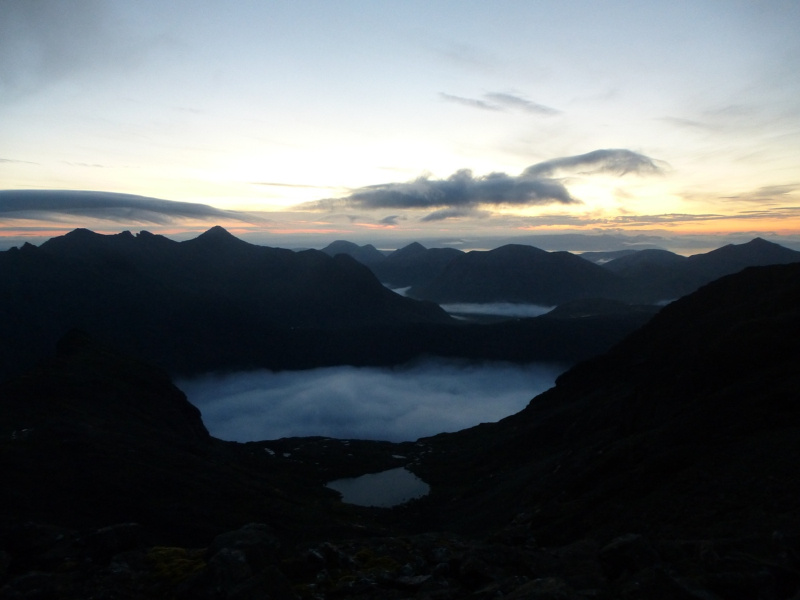 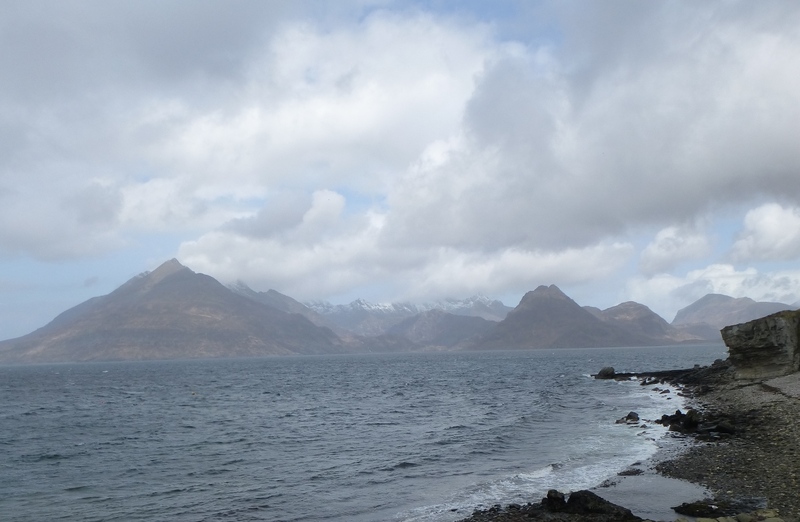 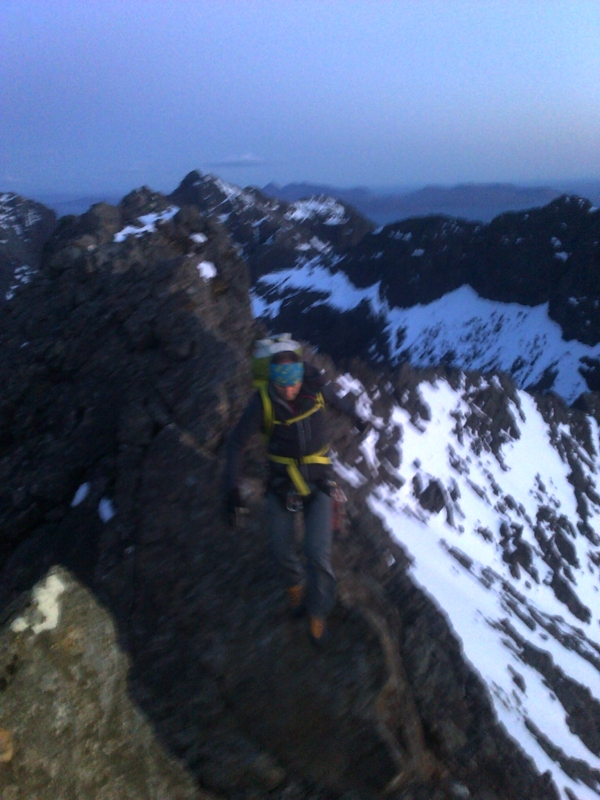 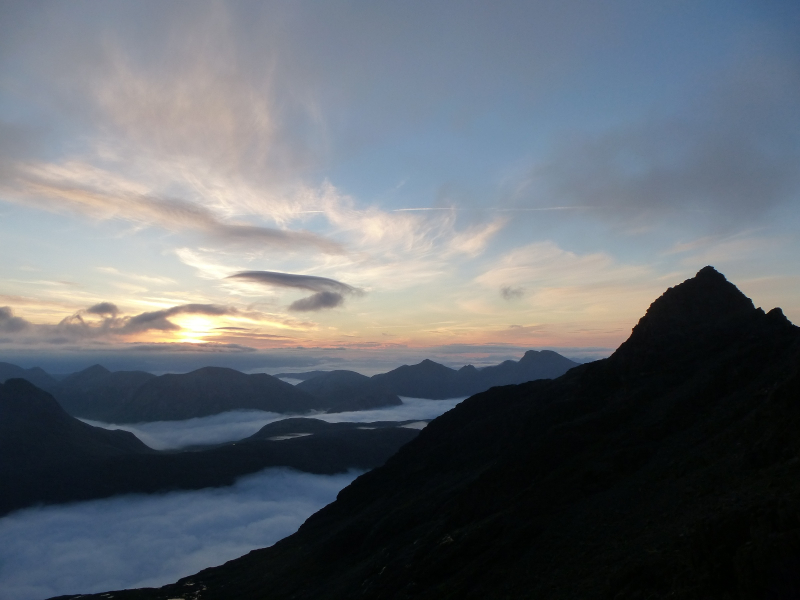 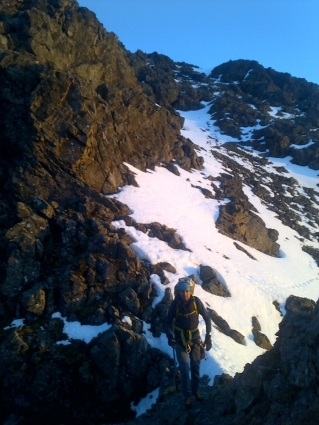 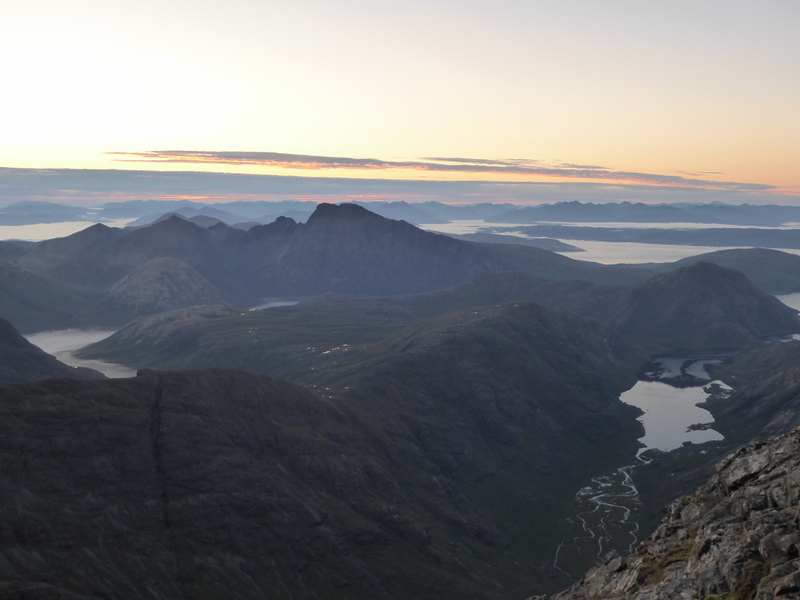 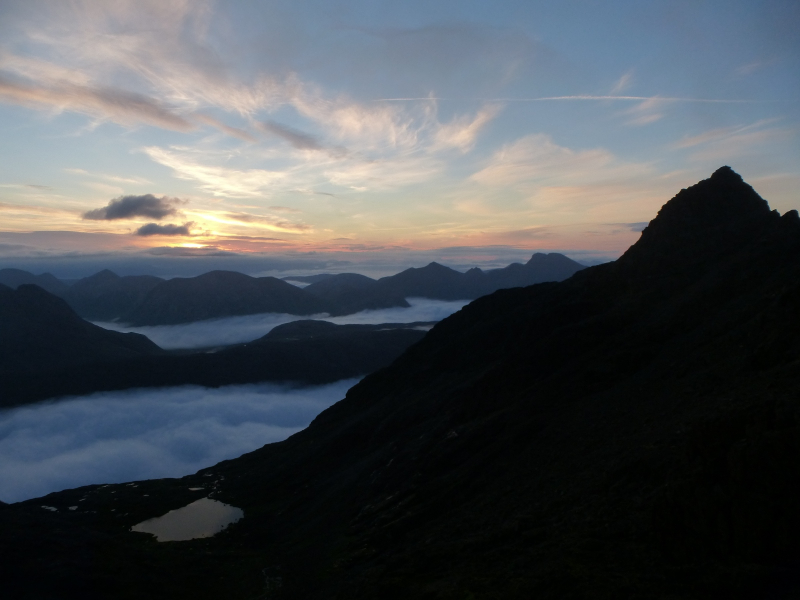 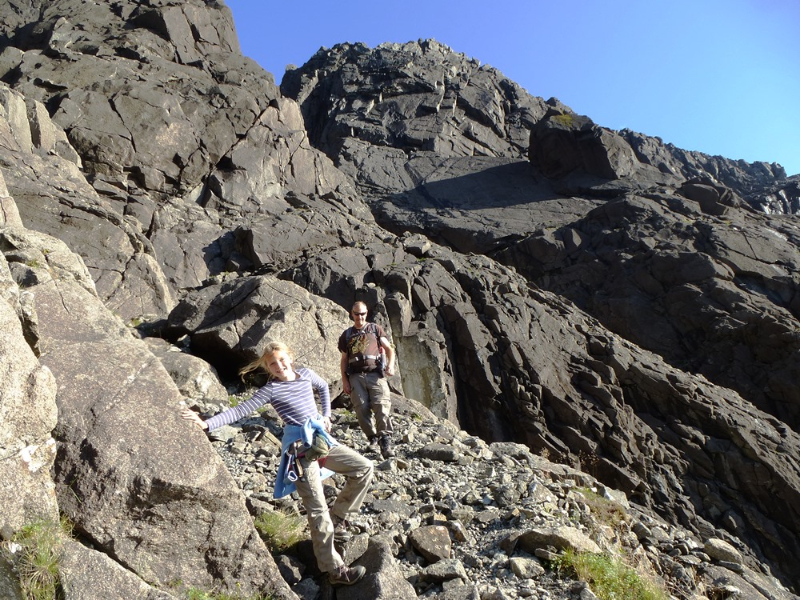 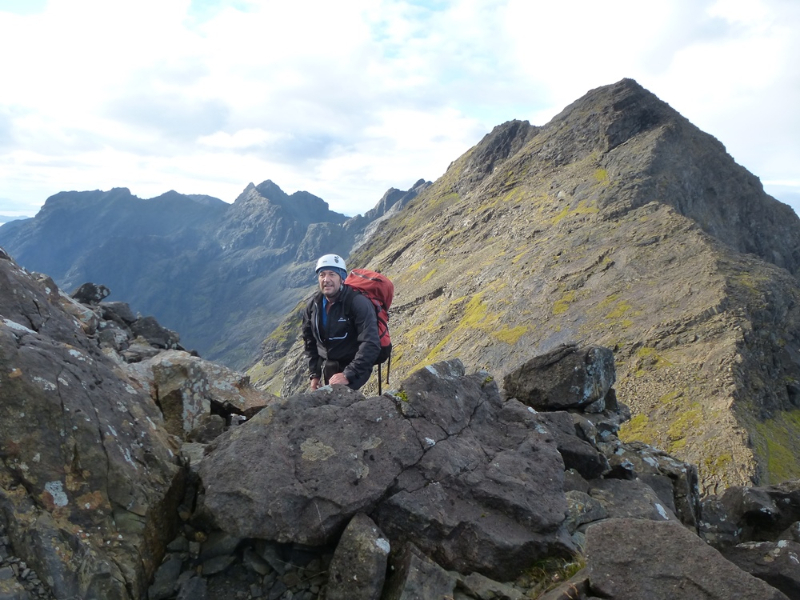 2 variations are marked in the Cuillin section for the more adventurous including a traverse of Bla Bheinn down to Camasunary and a detour into Coruisk via the Bad Step. 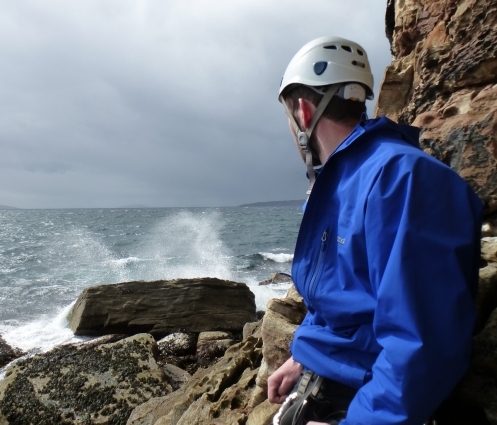 The 2014 map will also be the first made of the new generation of tough polyethylene that is both more waterproof but also far more resistant to tearing. 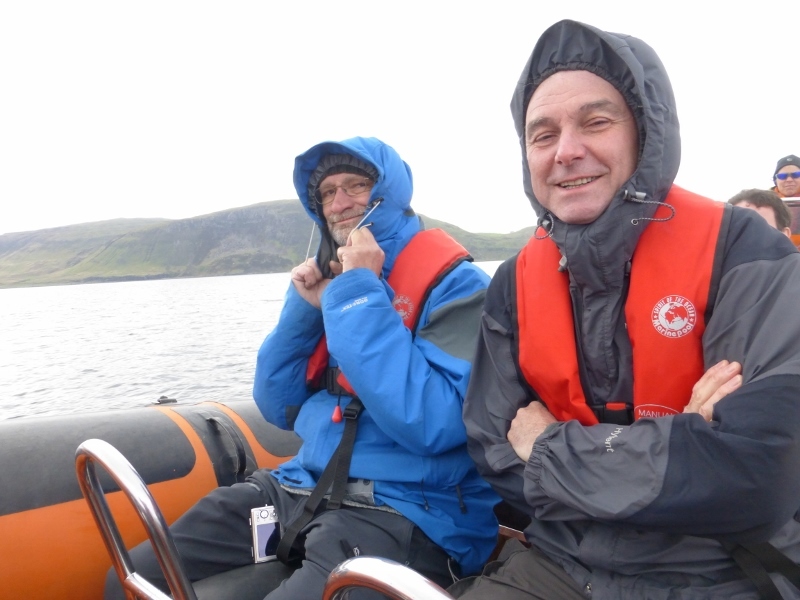 Great news for all, including our guides who carry their valuable copies every day through all sorts of weather. 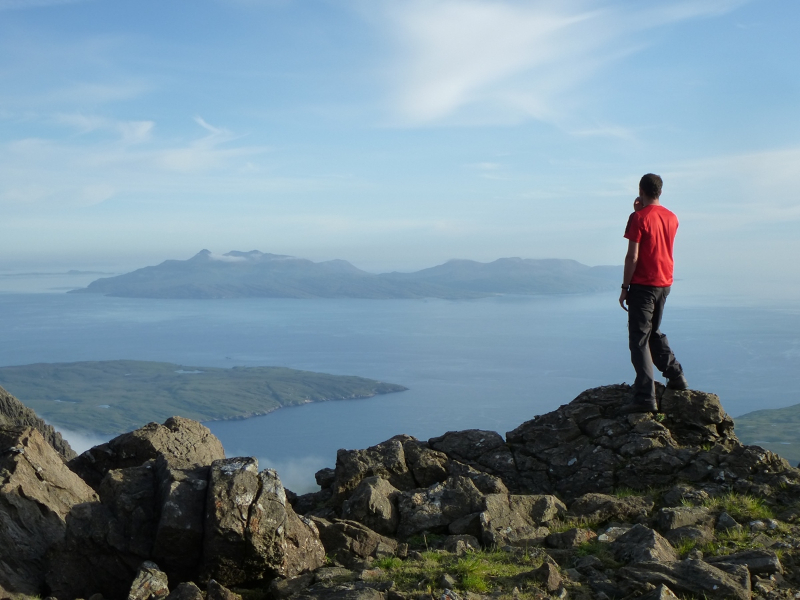 Apologies for not blogging so far this month; plenty going on but very little reliable broadband still! 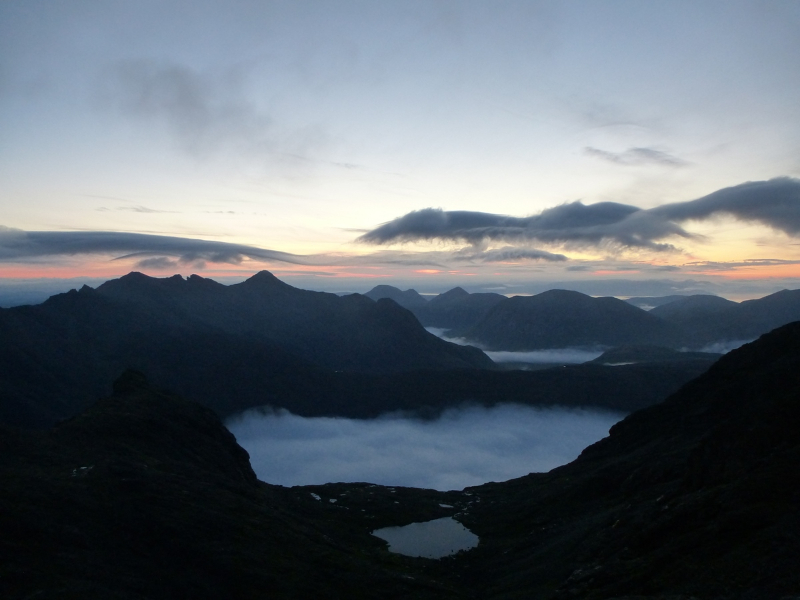 There’s been a mixed bag of weather and a late surge from the midgies but the majority of missions have been accomplished with the use of cunning tactics and a great attitude by clients and guides alike. 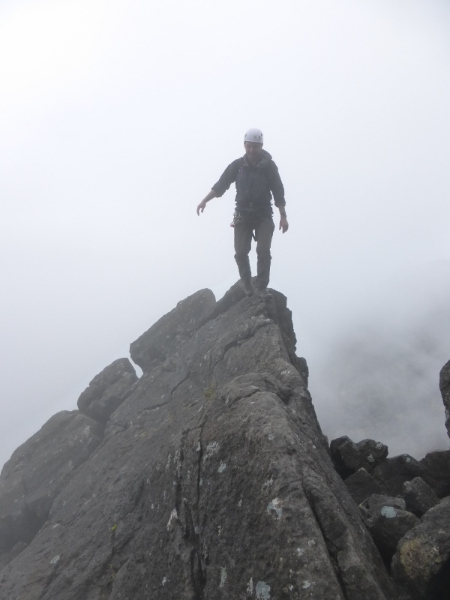 Monday last was only the fourth day this year that has been lost to the weather completely! 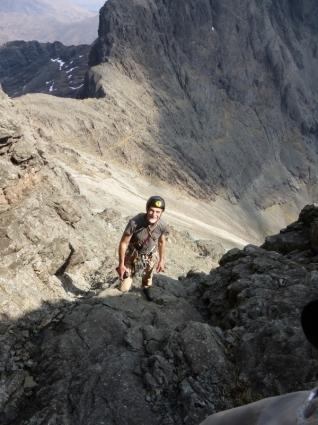 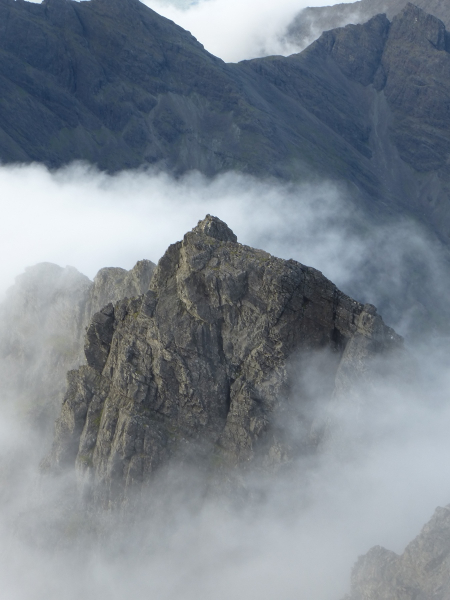 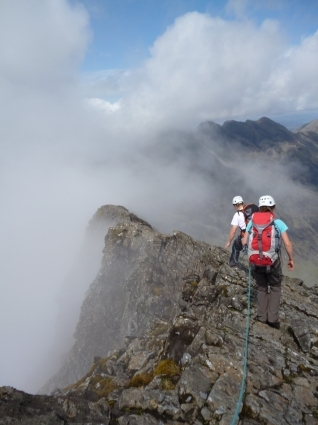 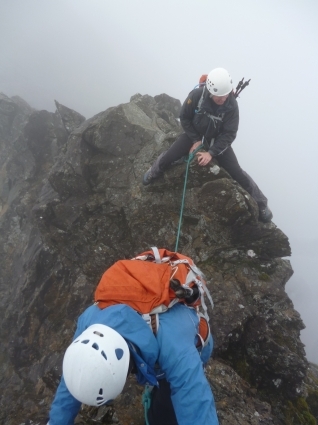 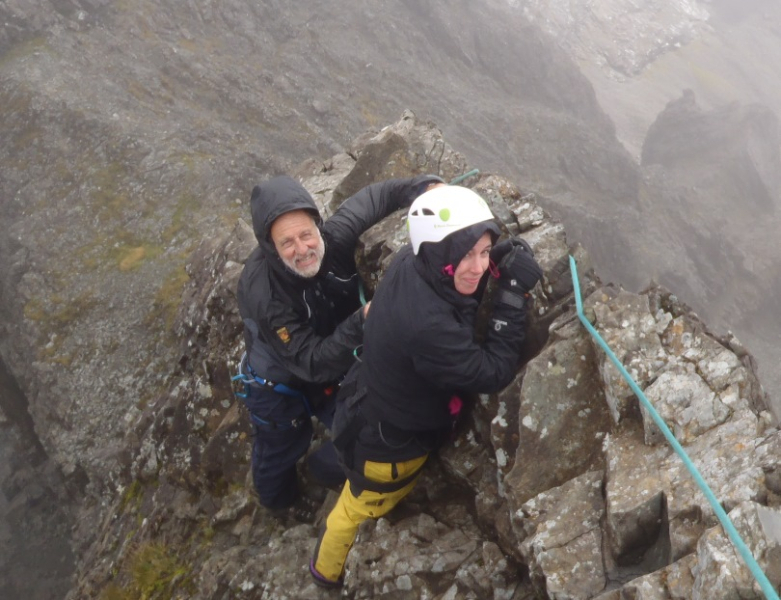 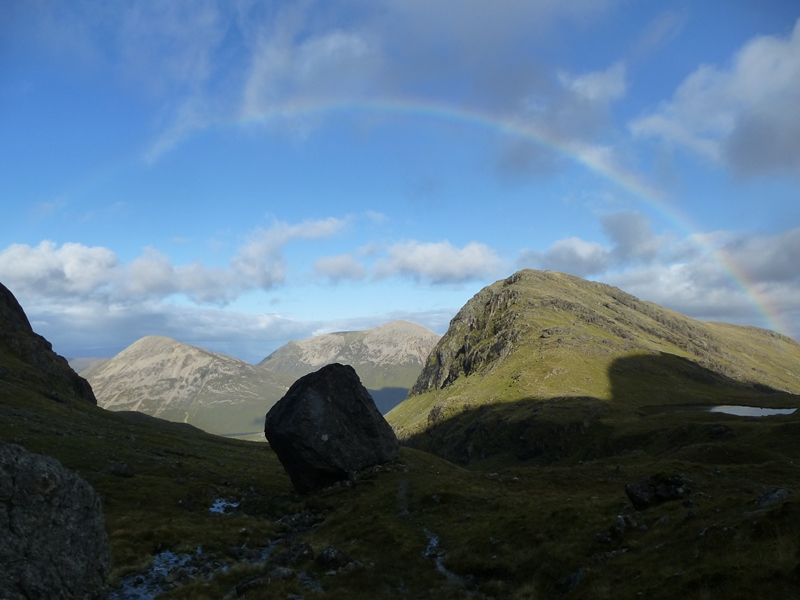 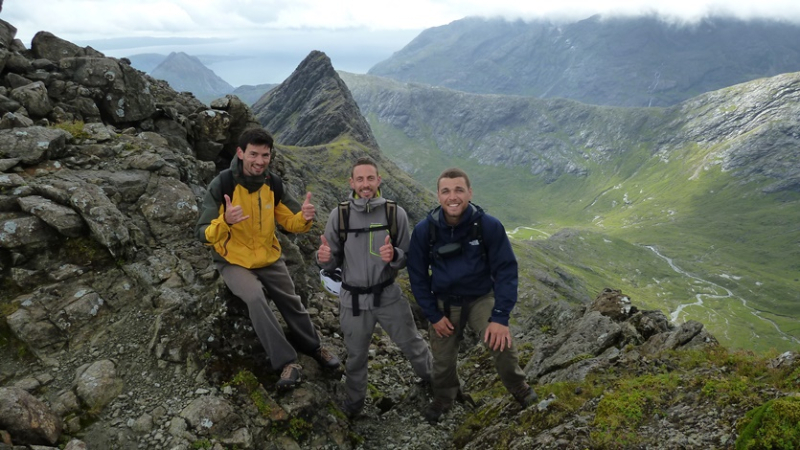 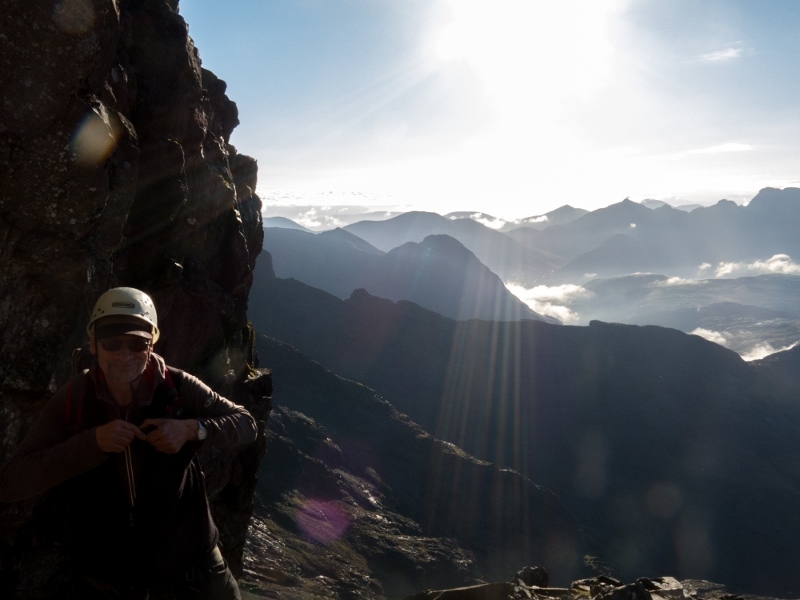 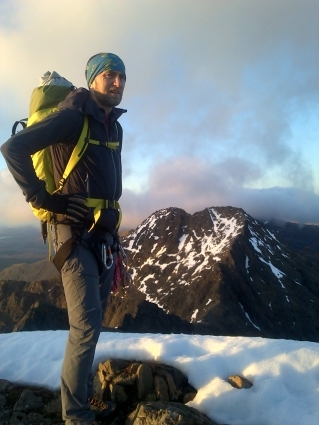 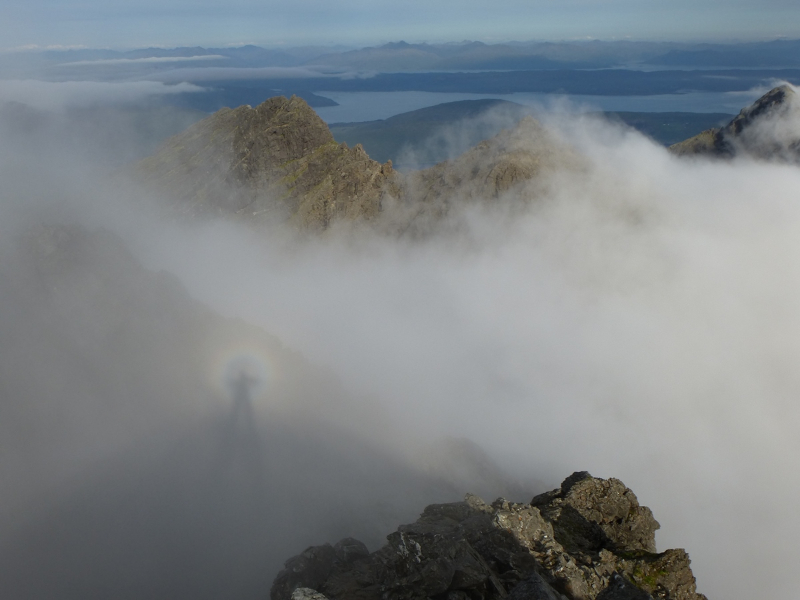 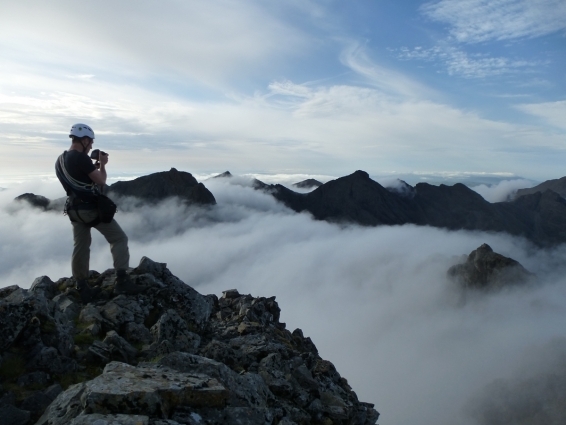 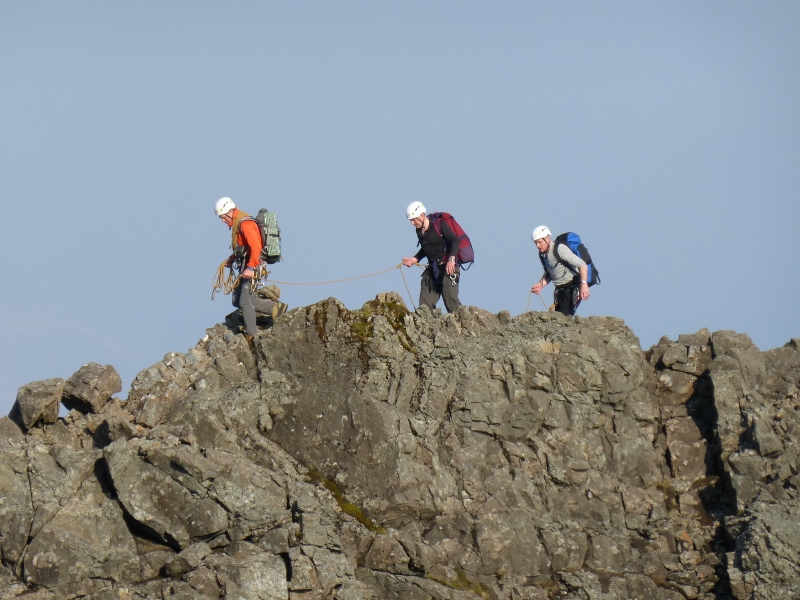 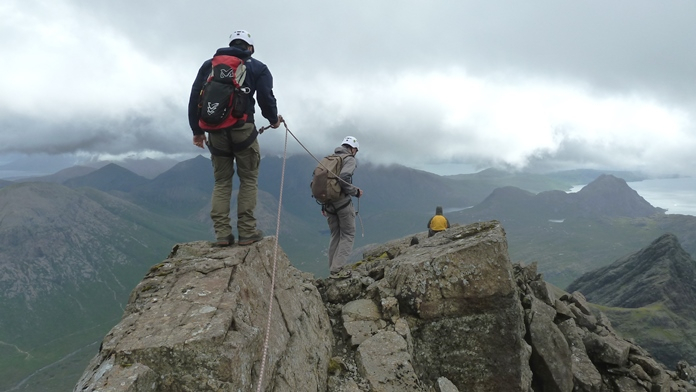 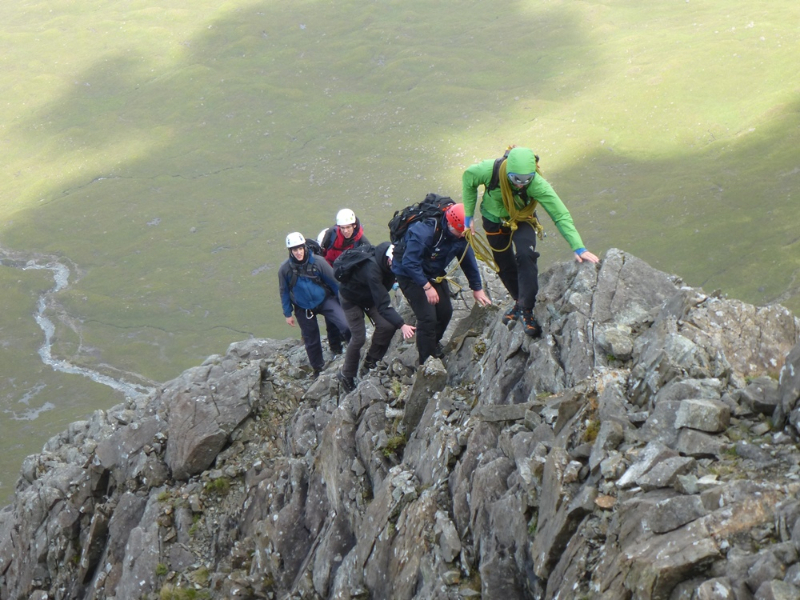 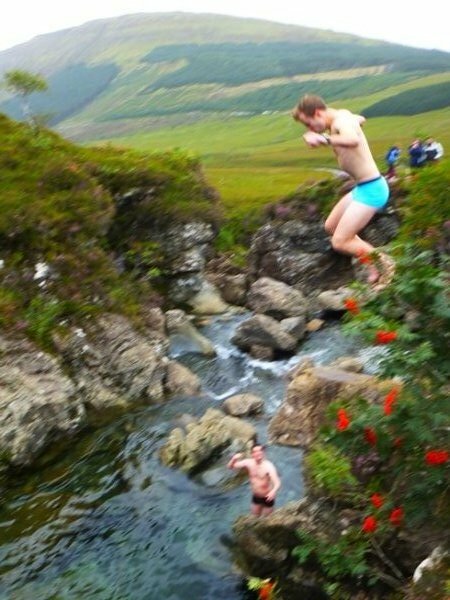 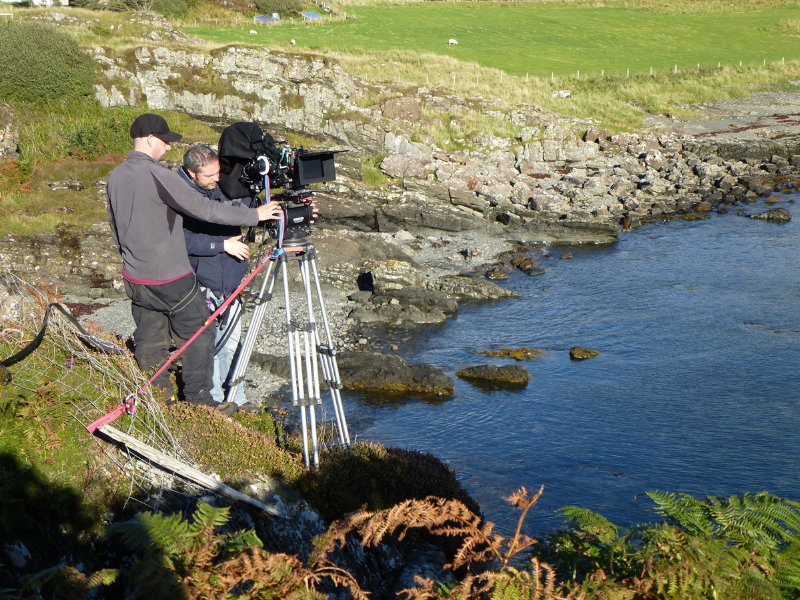 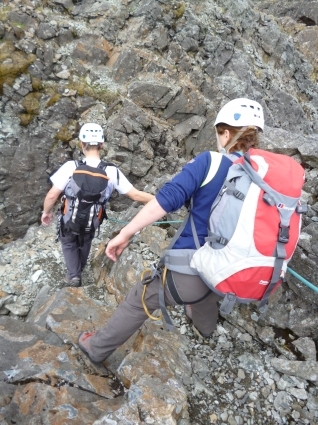 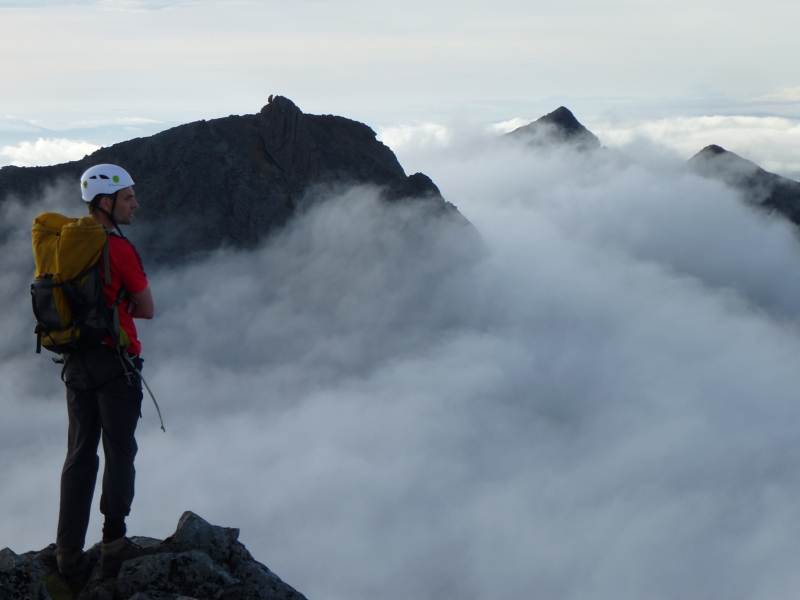 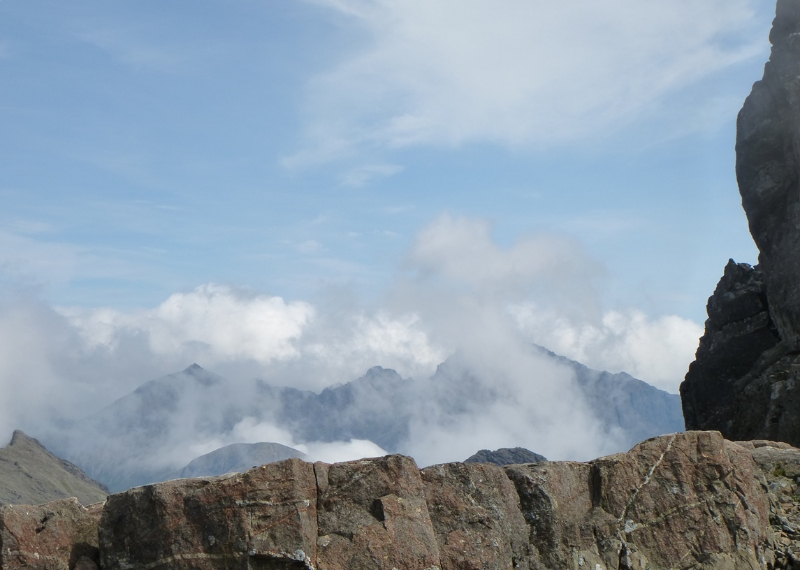 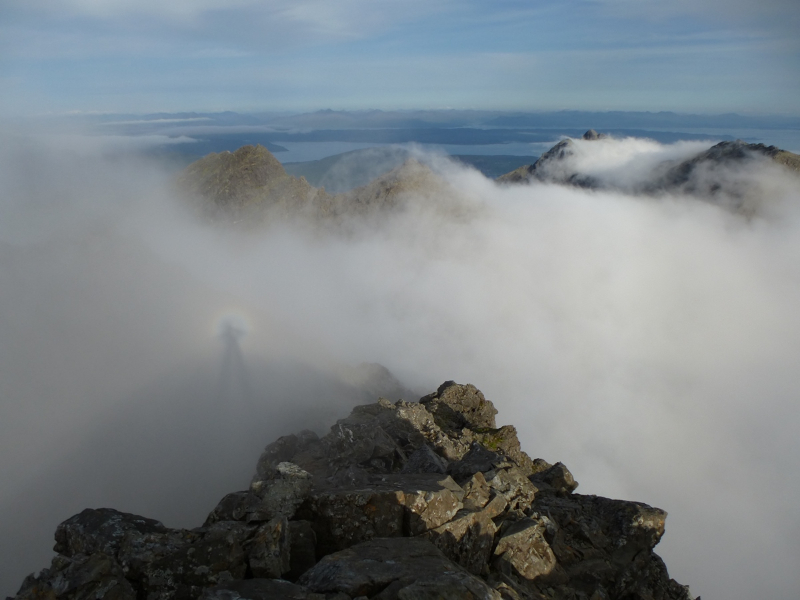 The work has varied from Ridge Traverses, stag dos and showing travel journalists the stunning Cuillin to stunt filming for a new Gaelic soap. 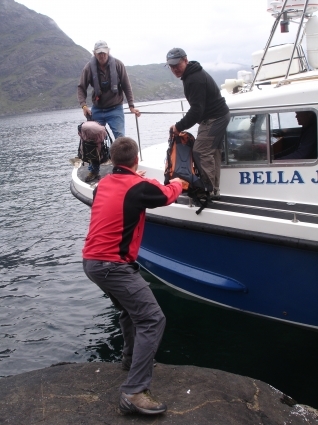 Clients have come from as far away as New Zealand, Majorca and Colorado; ranged in age between 11 to 70 years old. 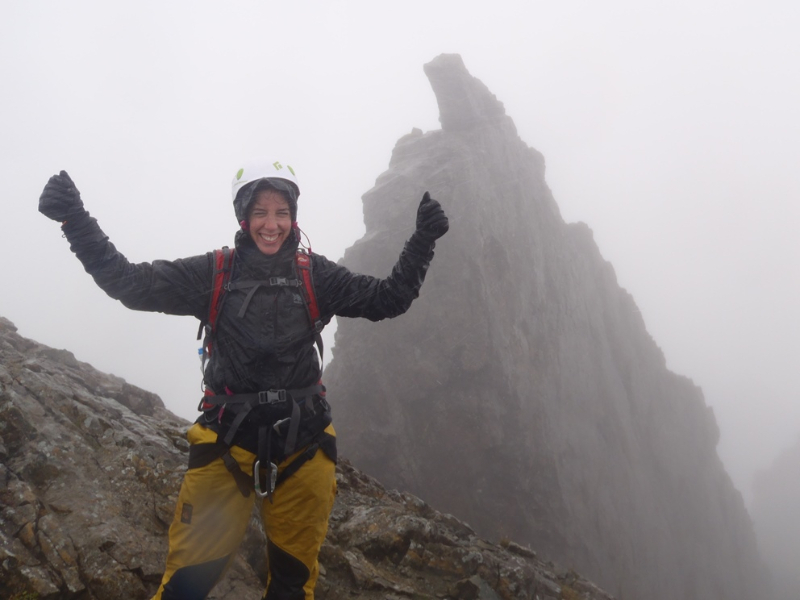 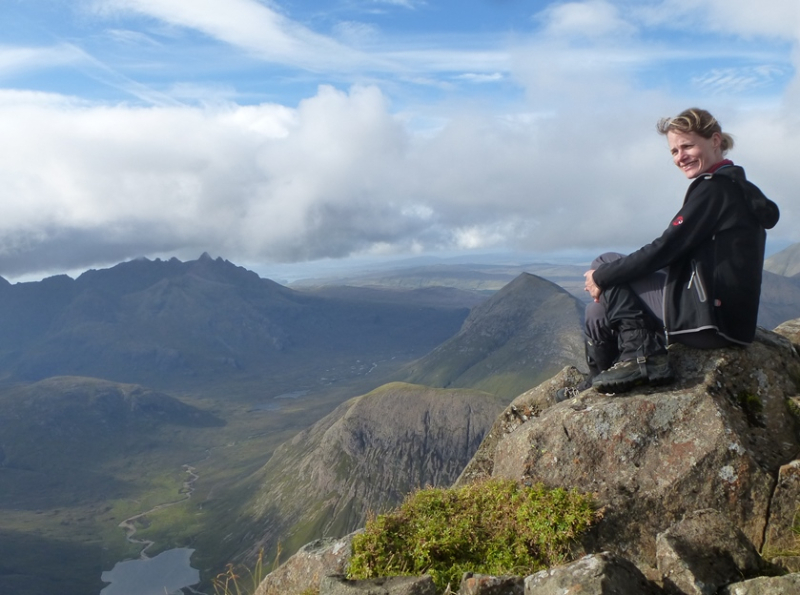 Major achievements include Jenny Dunn climbing her last Munro, Laura climbing the Pinn for her first ever mountain in full “Scottish” conditions and Marcus completing his long-held dream of a Cuillin Traverse. 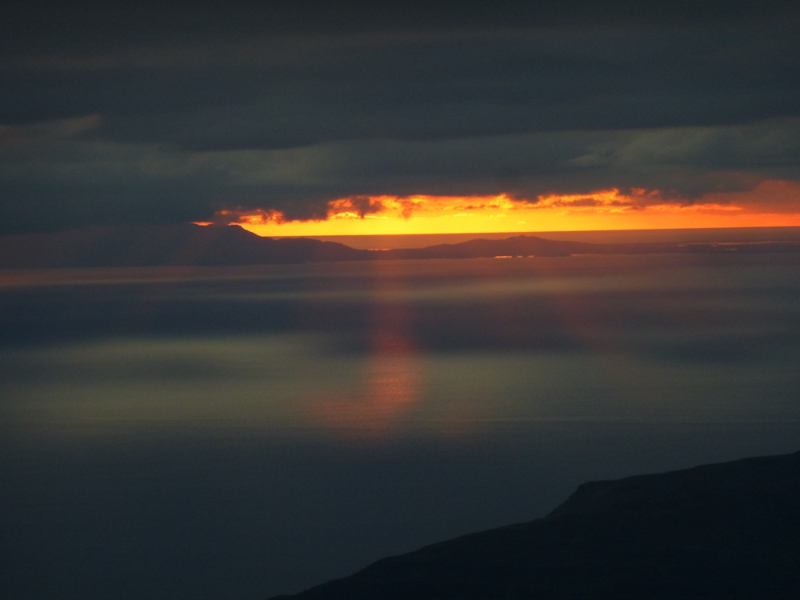 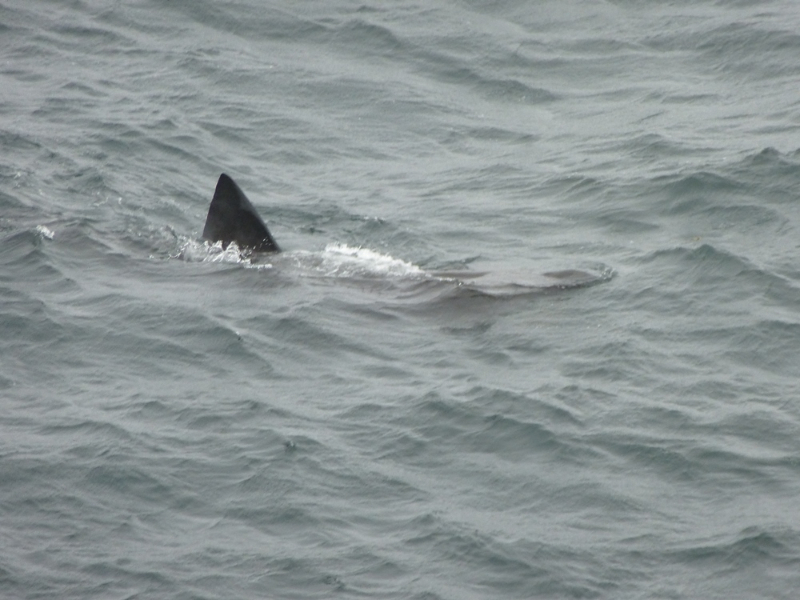 Basking sharks and Orcas, eagles Golden and White-tailed and the last of the alpine flowers like Devil’s Bit Scabbius have all added to the enjoyment. With a Ridge Traverse high on Mark’s ambitions I decided a day of intense training at Elgol was in order after 2 hard days in the snow. 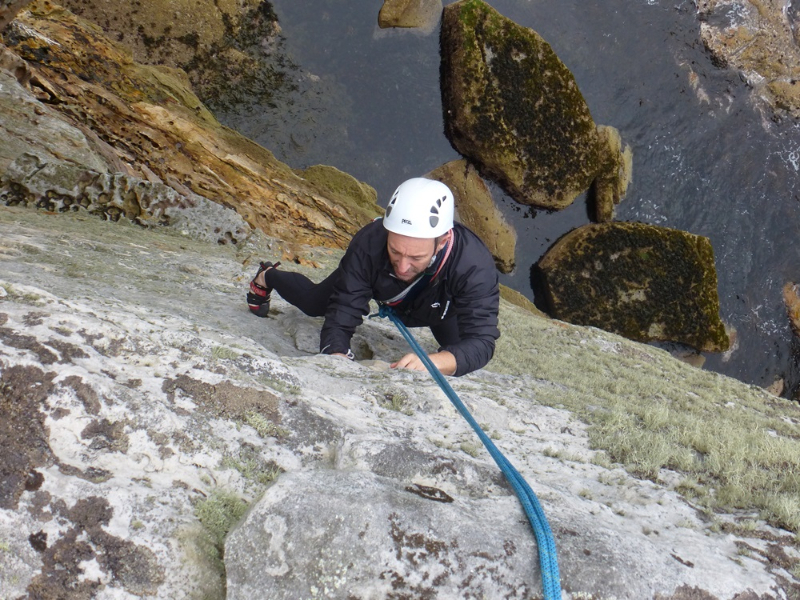 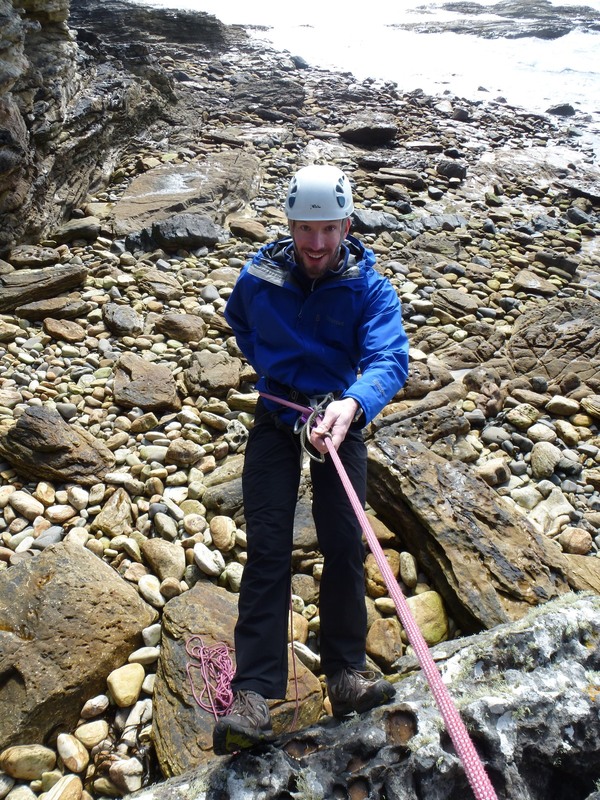 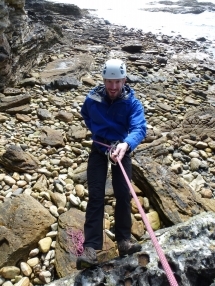 First was an hour of abseiling until Mark was completely happy doing everything himself. 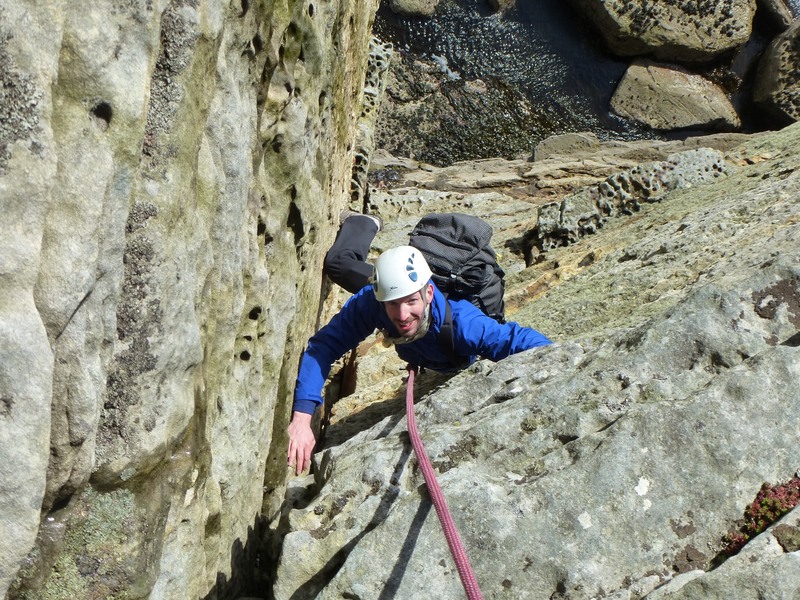 Next was some intense footwork on the easy slab which took Mark from a rock hugger to a smiling rock gymnast in a matter of minutes. 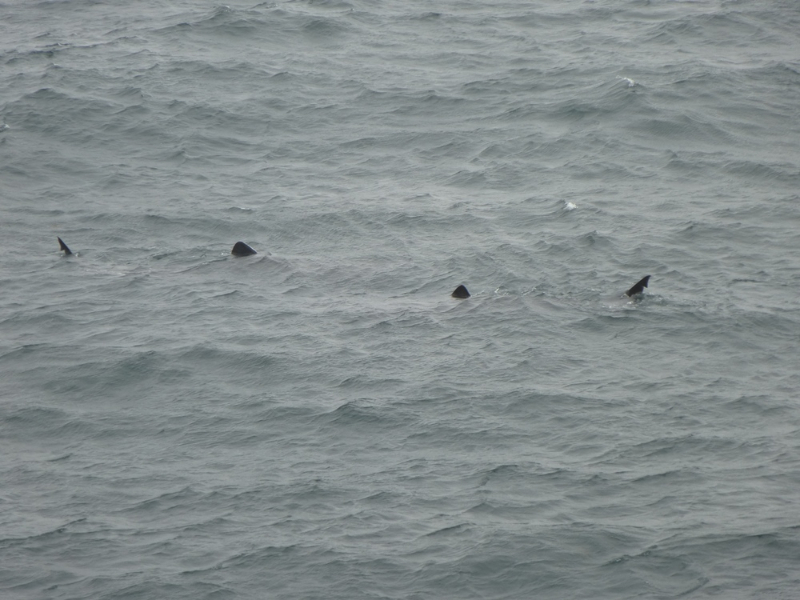 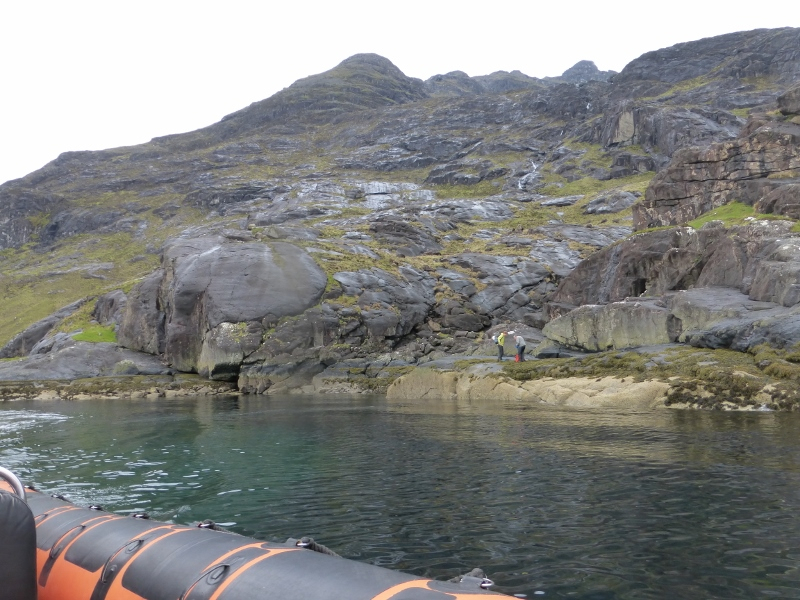 We had to dive for cover as a heavy shower passed over us but the rocks were dry enough to climb minutes later. After lunch we crossed the beach to the main cliff. 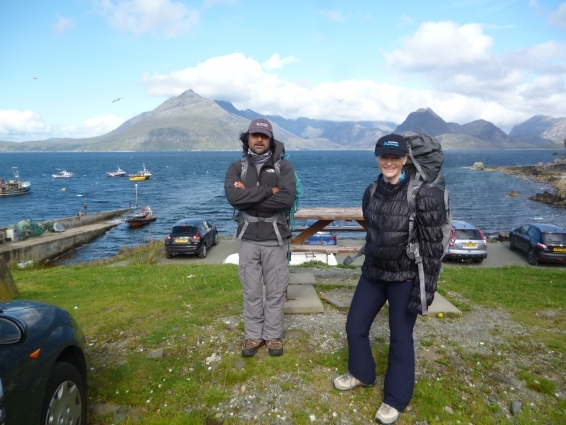 The noise of crashing waves reverberated under the huge rooves and created a seriously intimidating feel as we perched on our tiny ledge. 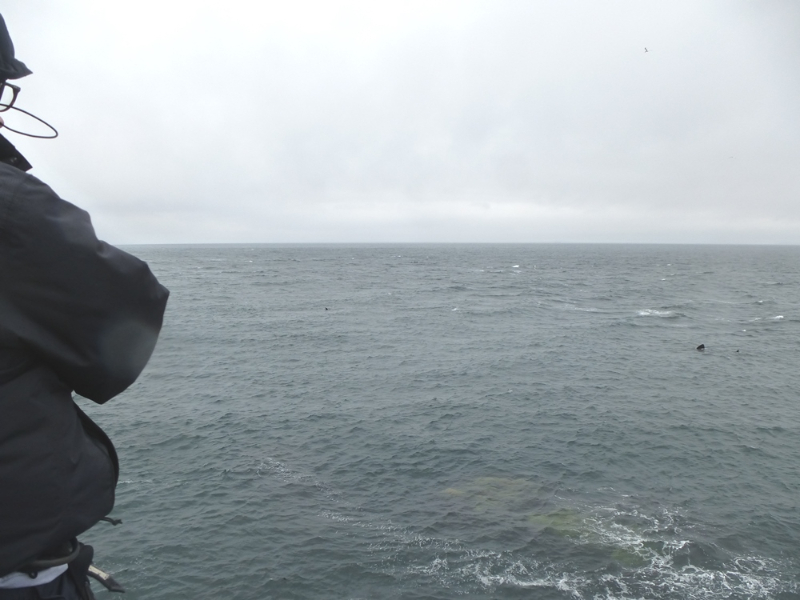 As we covered the important sequence of what was going to happen I watched the next shower storm across the Minch towards us but a tiny cave at the foot of Fertility Right kept us dry. 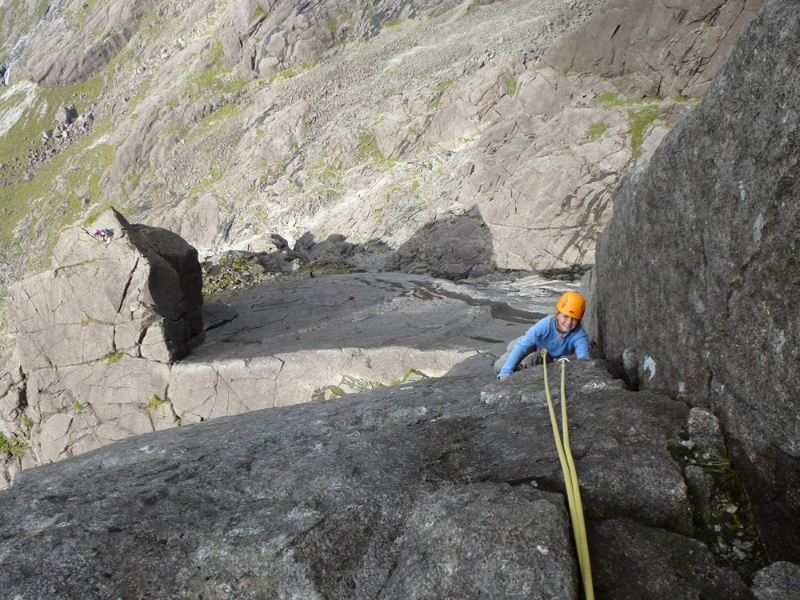 Good days out despite our wonderful weather bubble bursting. 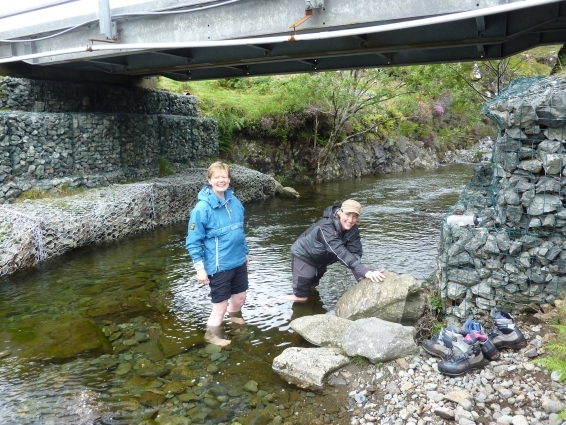 Dodging between some pretty awful rain showers for the past week but had a great day out with regulars Lisa & Vickie on Wednesday. 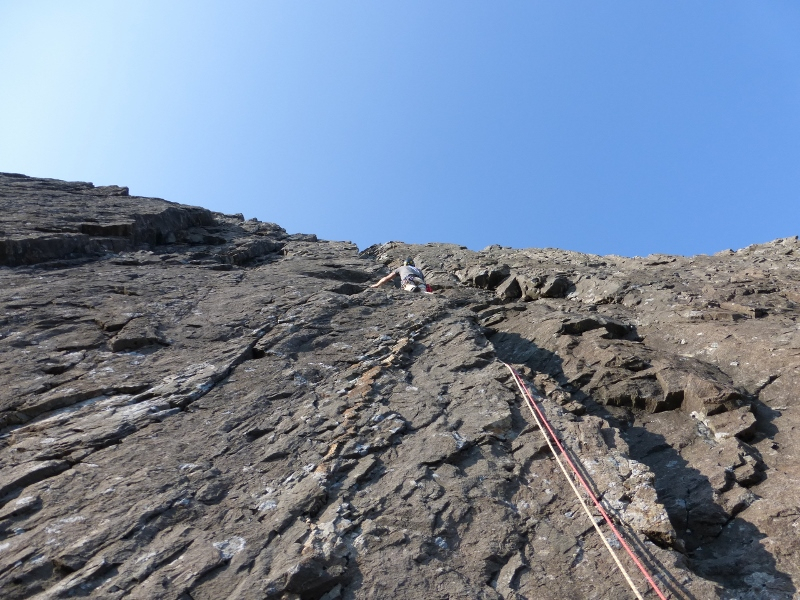 The weekend forecast improved enough to allow a Traverse attempt. 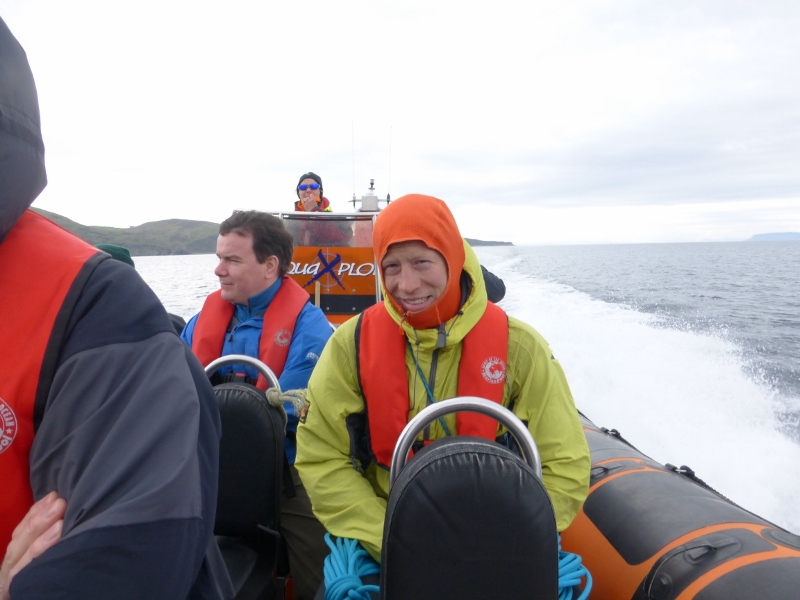 Rehen, Catherine & I took a ride in with Alex on the AquaXplore RIB on an increasingly choppy sea. 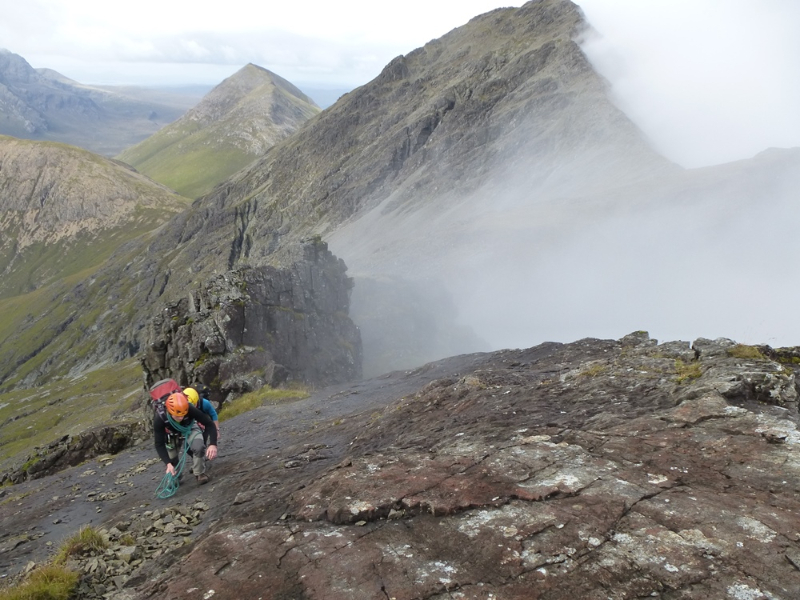 By the time we reached Gars-bheinn the tops were cloud covered once more and the winds were strong enough to knock us right over. 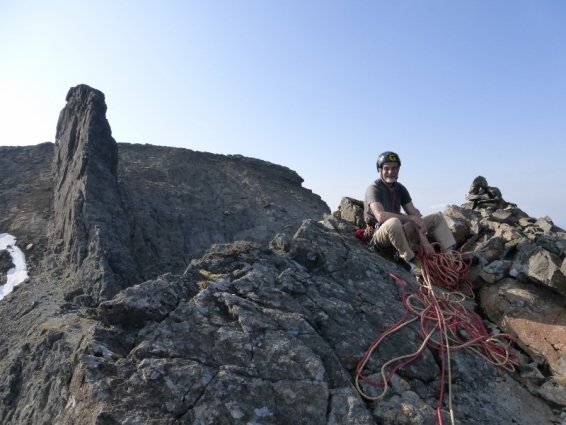 Progress was slow & hard work as we battled to keep our feet along the “easy” section of the Ridge. 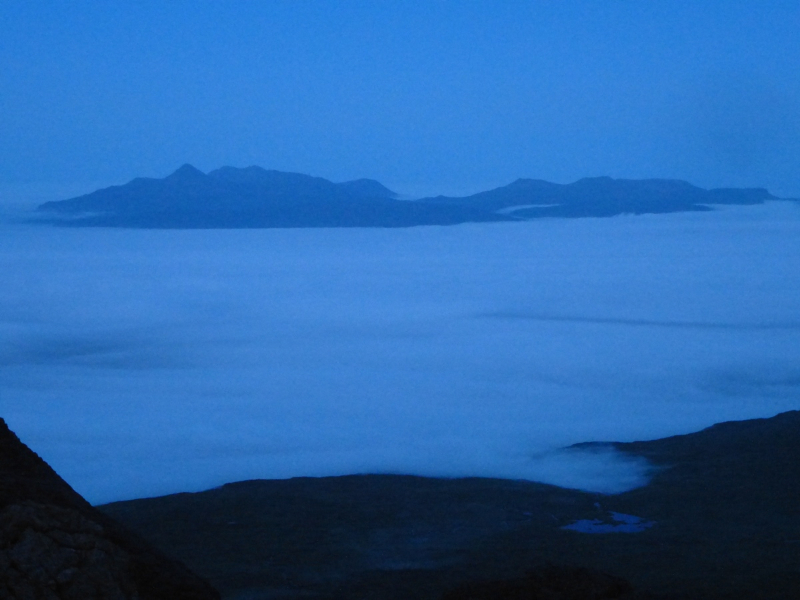 Overnighting in Coir’ a’ Ghrunnda we went to bed early hoping to wake in the perfect weather that was forecast but mist still clung heavily at 6am. 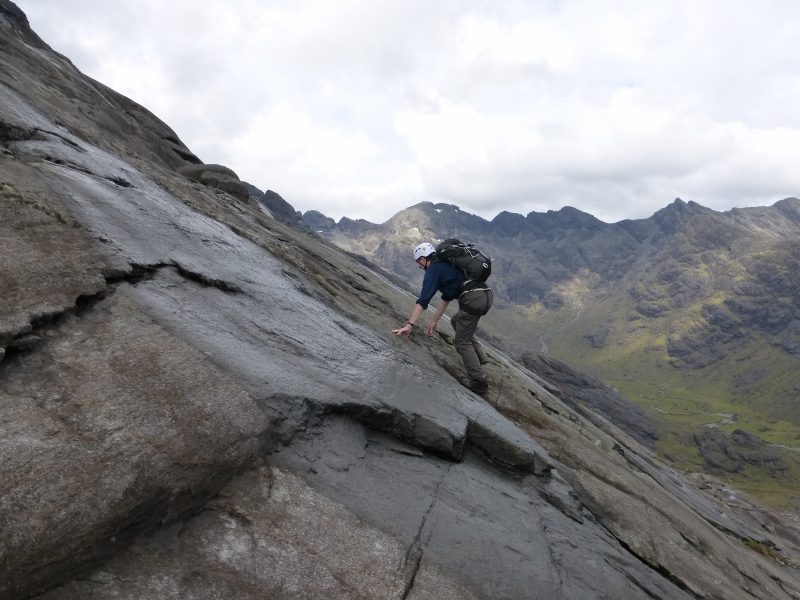 The rocks were only slightly greasy on the rise up Alasdair but the exposed crest was soaking and treacherous to the Stone Shoot. 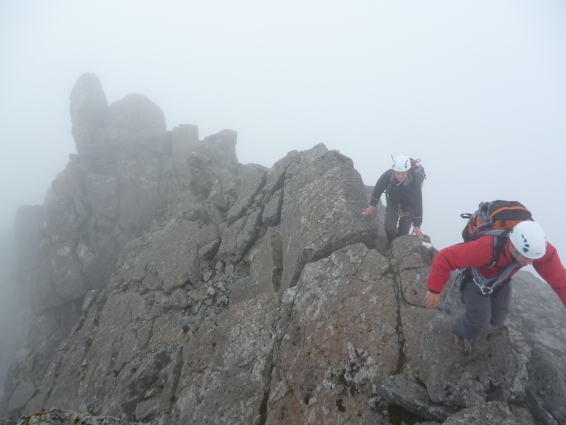 We resisited the temptation to run away and made good progress to reach the Pinn at 11am. 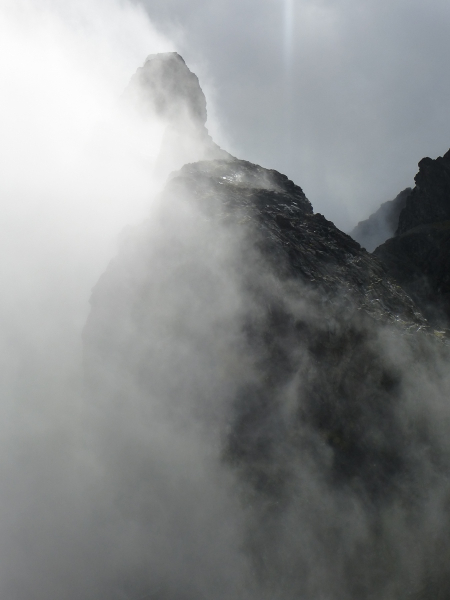 The mists were finally clearing the tops and all those who had been lost finally seemed to home in on the Pinn. 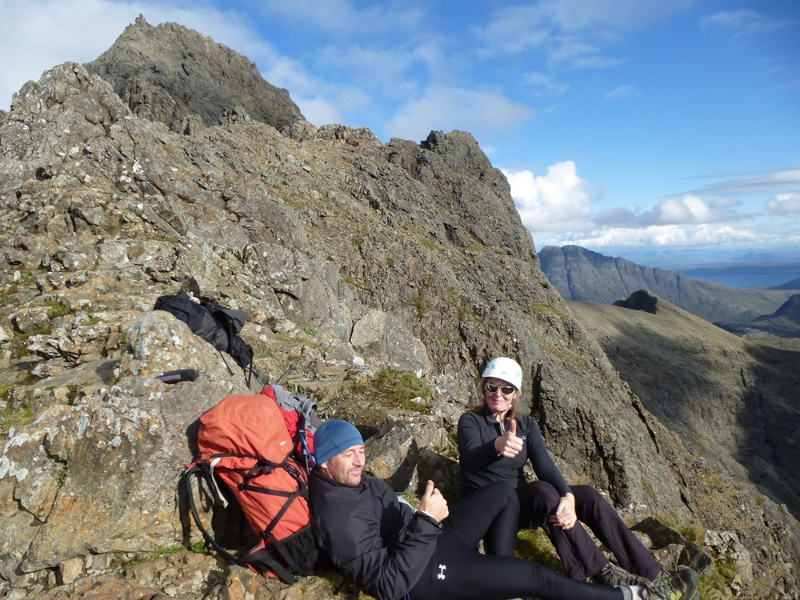 We got up just ahead of the mighty crowd and were briefly joined by Dave on his penultimate Munro. The visibility and views continued to improve as we headed north and my Canadian guests were finally able to see the beauty of the Cuillin. 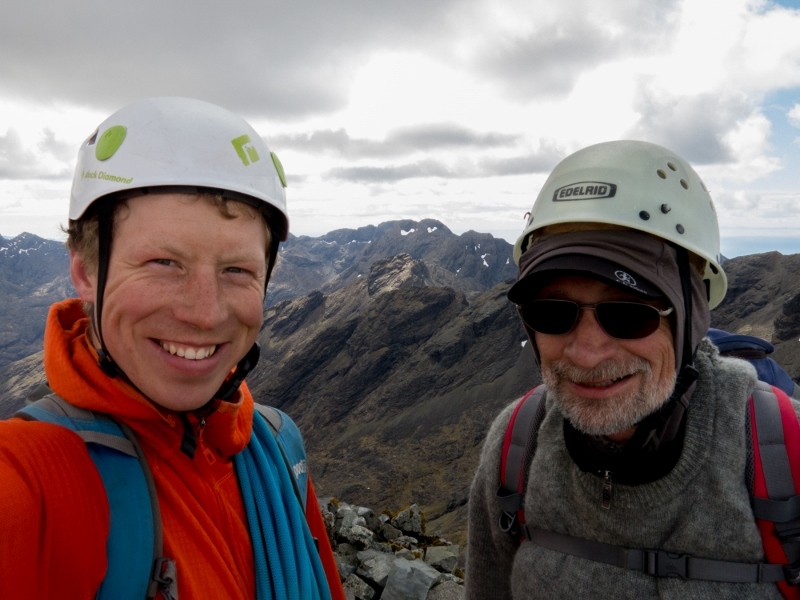 Their previous summit was Mount Everest back in May and it was fascinating listening to their tales but also good to see and hear how much they appreciated the climbing and scenery in our wonderful wee mountains. 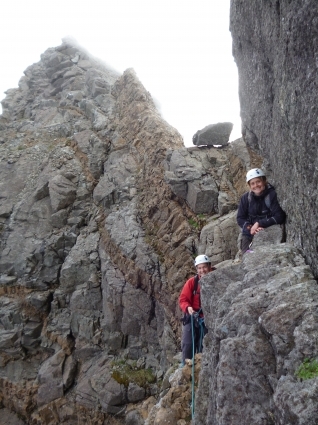 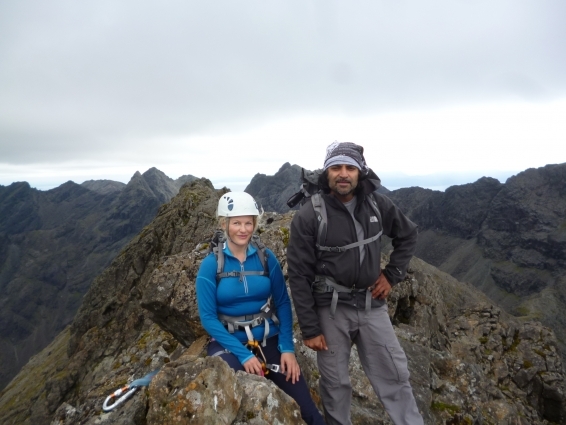 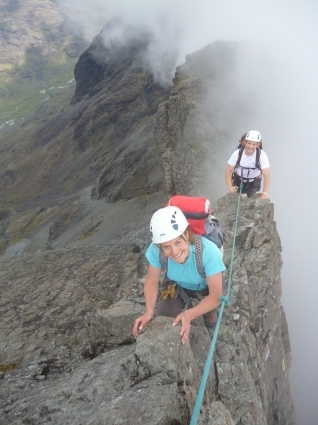 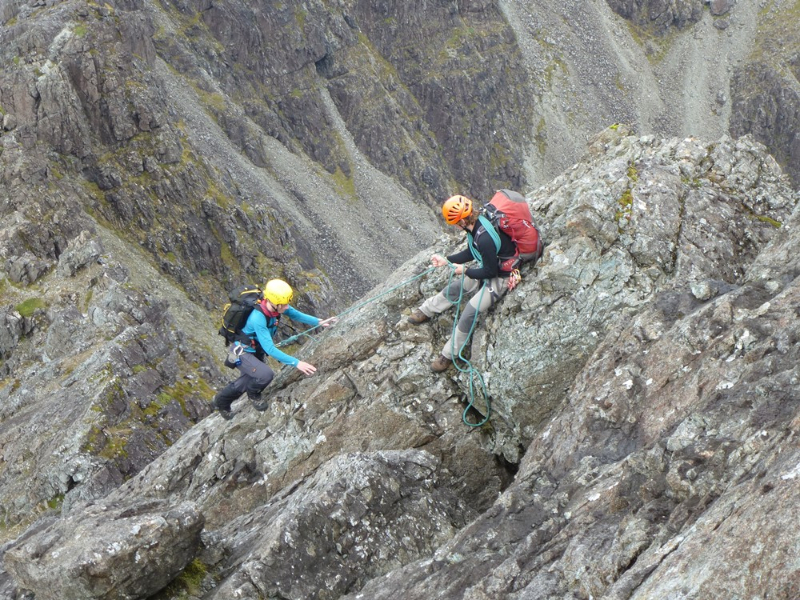 Catherine and Rehen with everything they had climbed in the Cuillin layed out behind them. 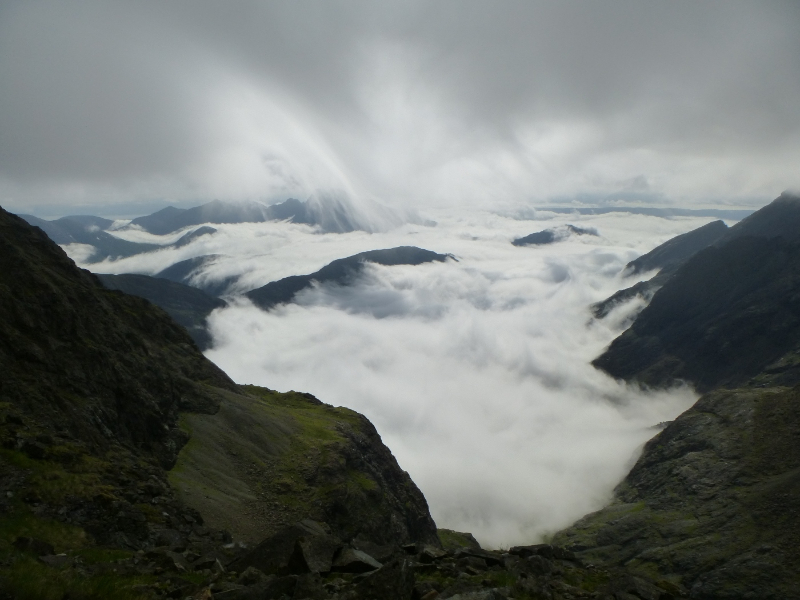 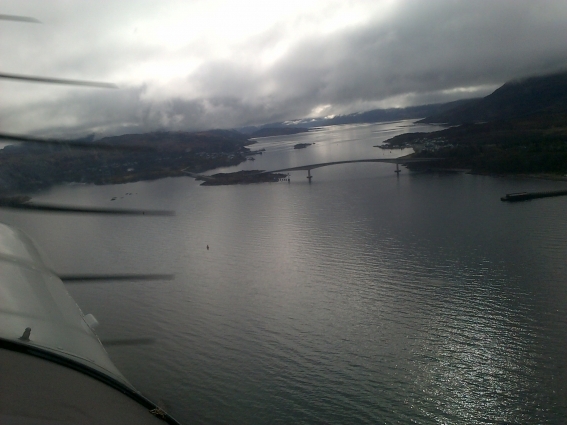 We descended from An Dorus as black clouds drew in from the south and got down just before the heavens opened. 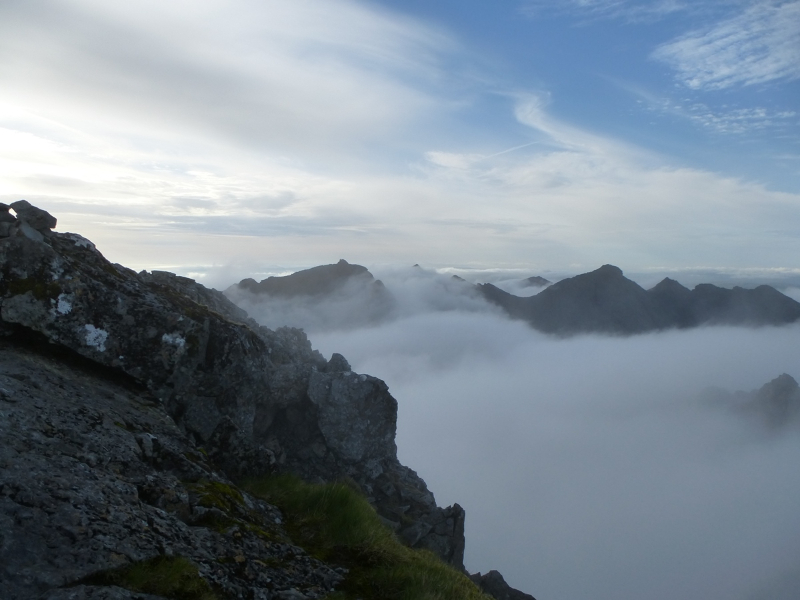 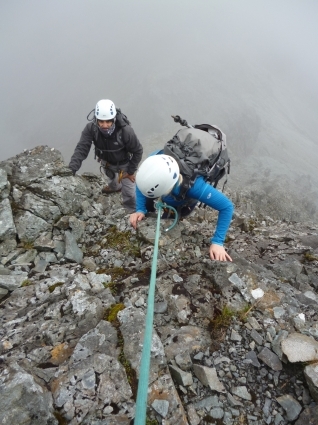 A drop in temperature and layer of cloud helped us keep a good speed up on the rise up Gars-bheinn. 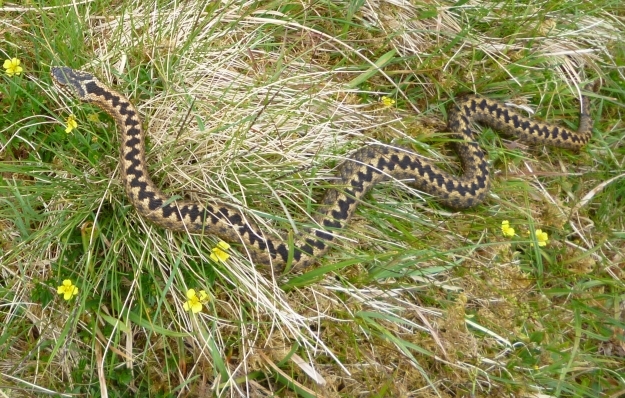 A real highlight was finding a beautiful large adder in thee grass hopefully looking for some rays. 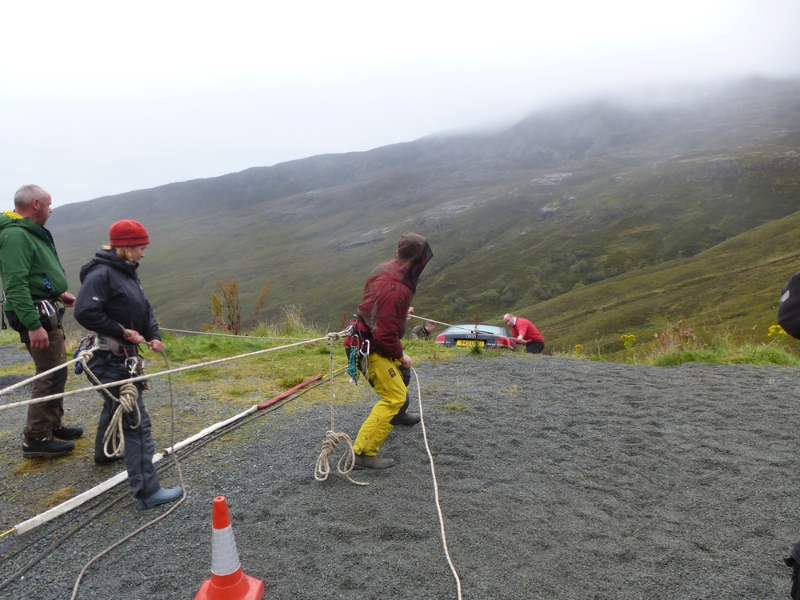 Rain meant we stayed in our very cosy pits until 11-30 the next morning; a record 18 hours of patience, eating, drinking & snoring! 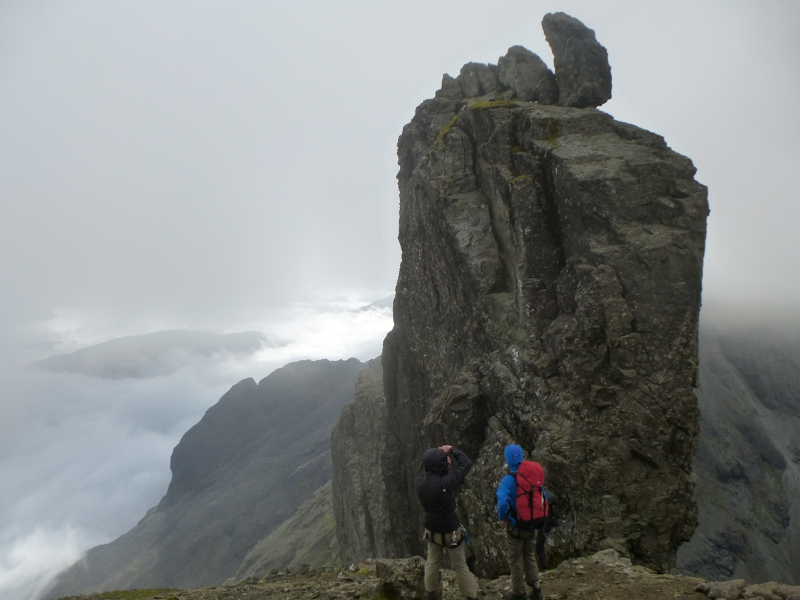 As predicted the rain stopped and the rocks started drying out in front of our eyes as we headed off shortly after midday. 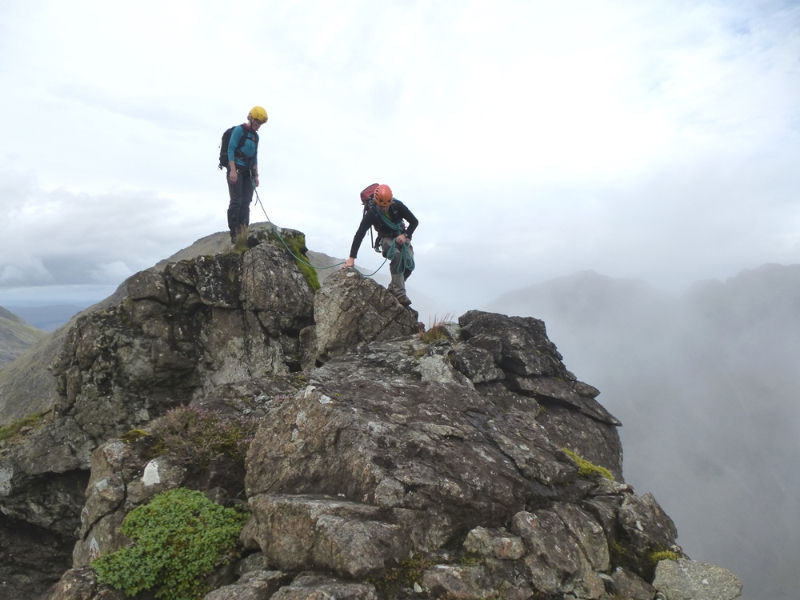 The rope kept us confident and upright until the mists finally burnt off as we descended from Sgurr Mhiccoinnich. 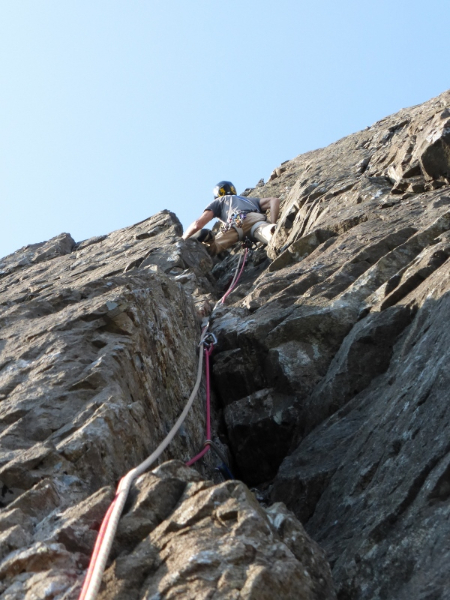 With the first technical section done it was time to put the foot to the floor and make up some time. 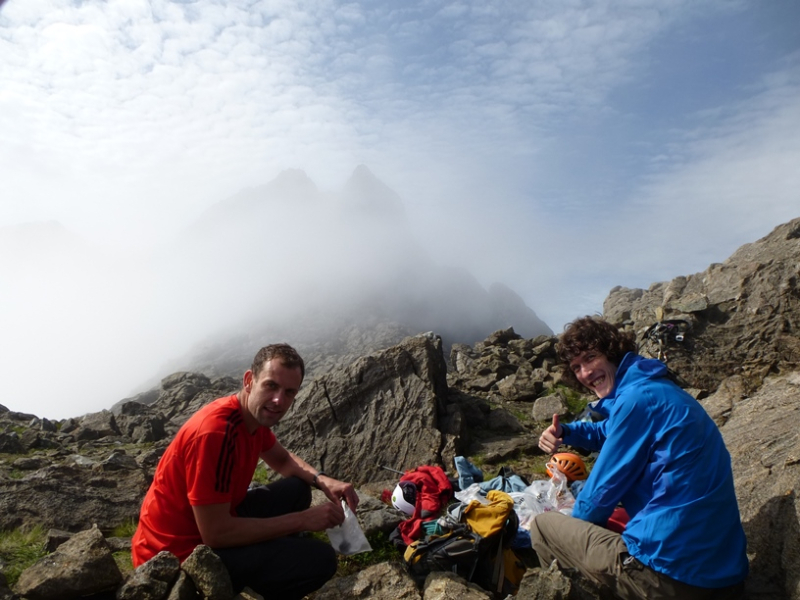 Kate (nee Baily) holds a fair number of running records and brand new husband Geraint is no slob either. 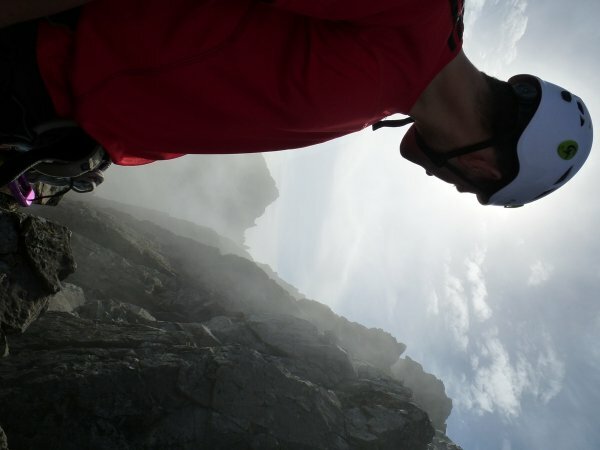 Cool breezes and thin cloud cover helped us eat up the miles. We reached Bruach na Frithe not long after 6-30pm and the guys still felt good for an ascent of Naismith’s route on the Tooth. 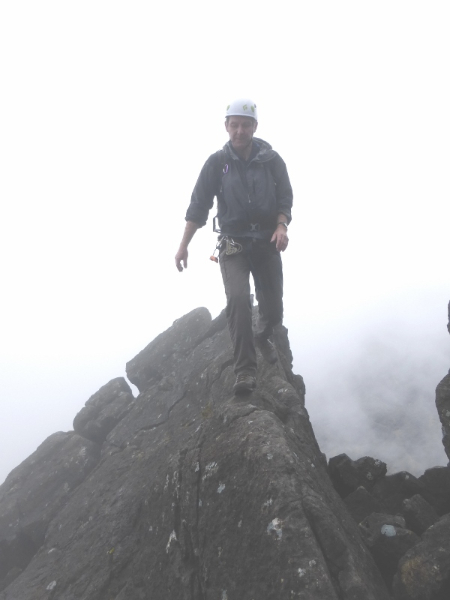 A cold wind picked up and the mist drew in as we topped out on Gillean just after half past eight. 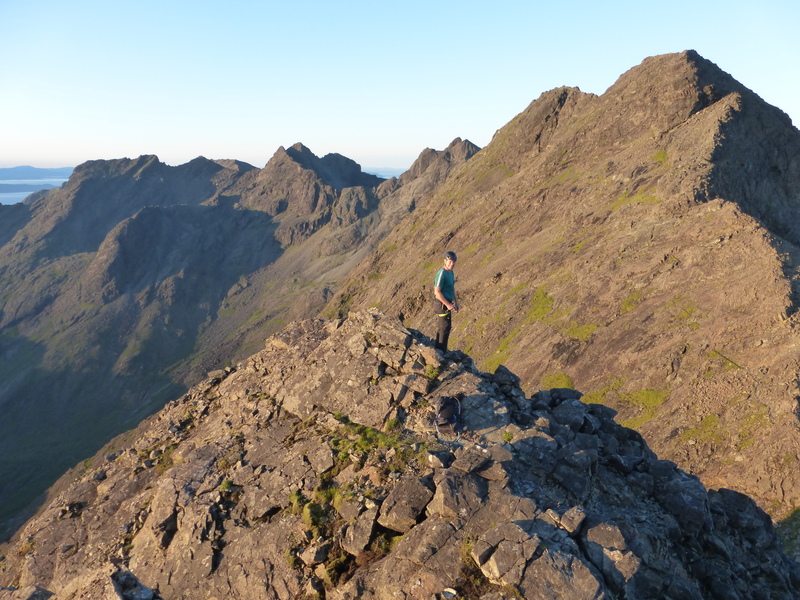 Having been through everything the Cuillin & I could throw at them, this pair of runners got their own back by beasting me down hill in the setting sun for a very fine tasting cold pint in the Slig. 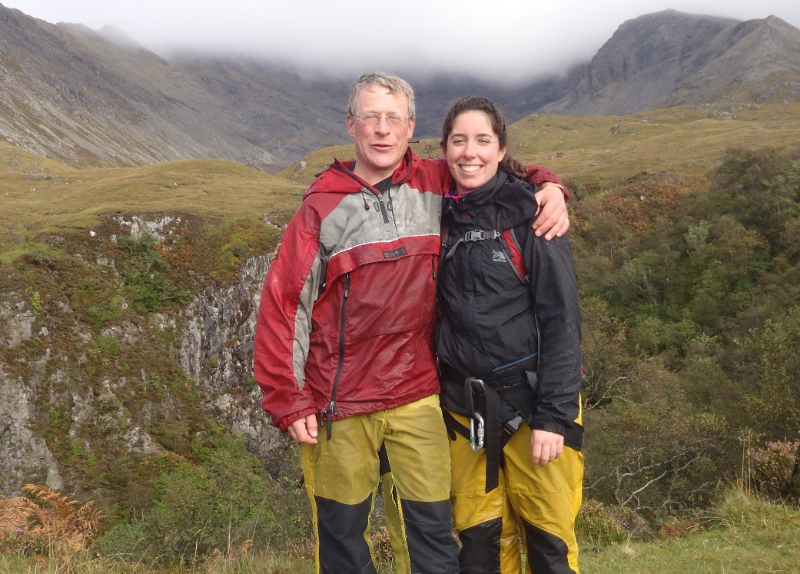 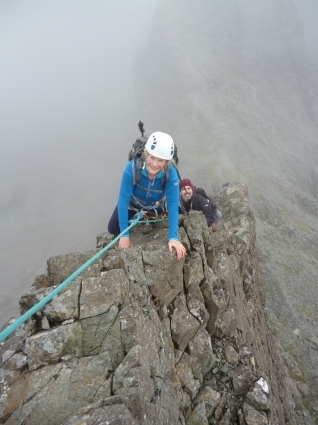 Many congratulations to Kate & Geraint Davies on getting married last Saturday and for spending their honeymoon completing a very fine Traverse in less than 12 hours end to end (if you ignore the rain-break! ).